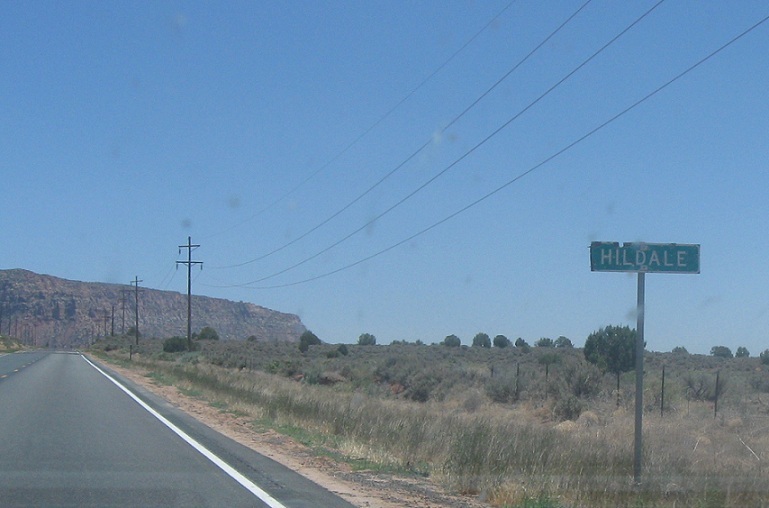 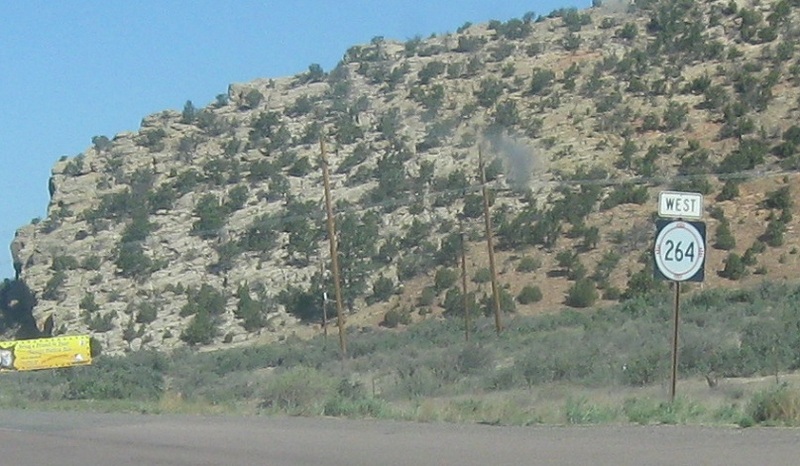 (Colorado City, AZ) Just before leaving Utah, we’ll enter the polygamist town of Hildale, Welcome to Arizona!, just as we enter Arizona we’ll enter the polygamist town of Colorado City, first SR 389 shield, in Fredonia 389 is trailblazed as TO I-15. 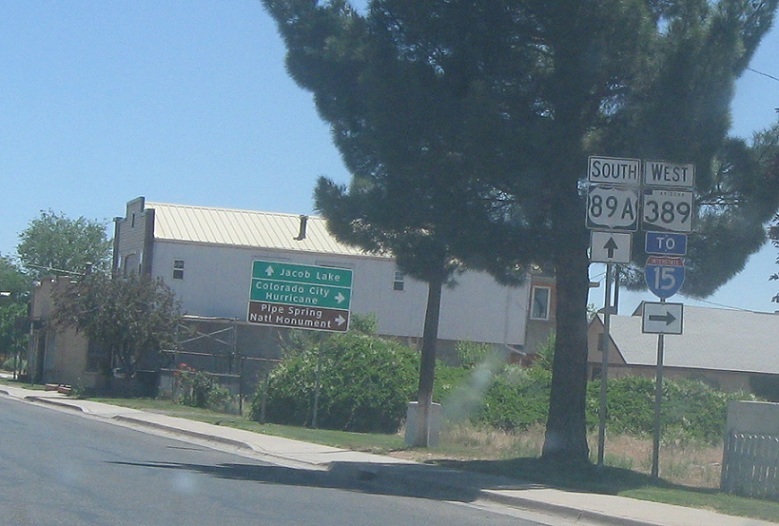 (Fredonia, AZ) First US-89A shield in Kanab, AZ State Line, Welcome to Arizona!, in Fredonia, we’ll get a trailblazer to I-15 in Utah via 389. 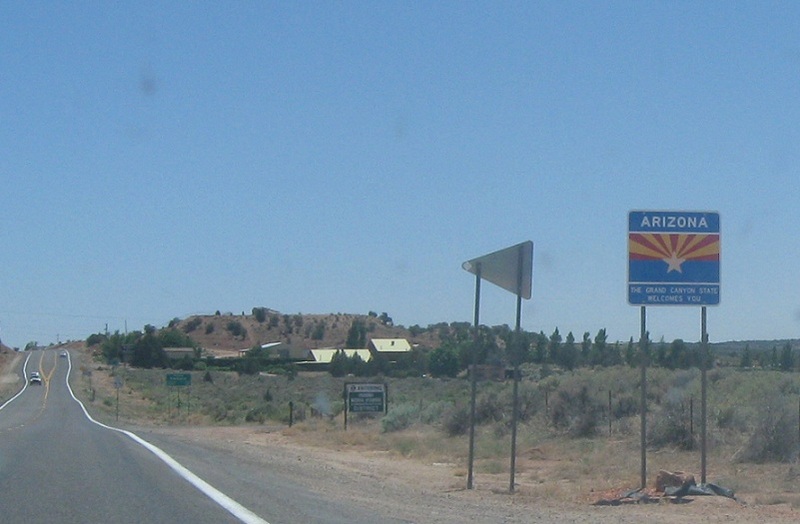 (Page, AZ) Welcome to Arizona! 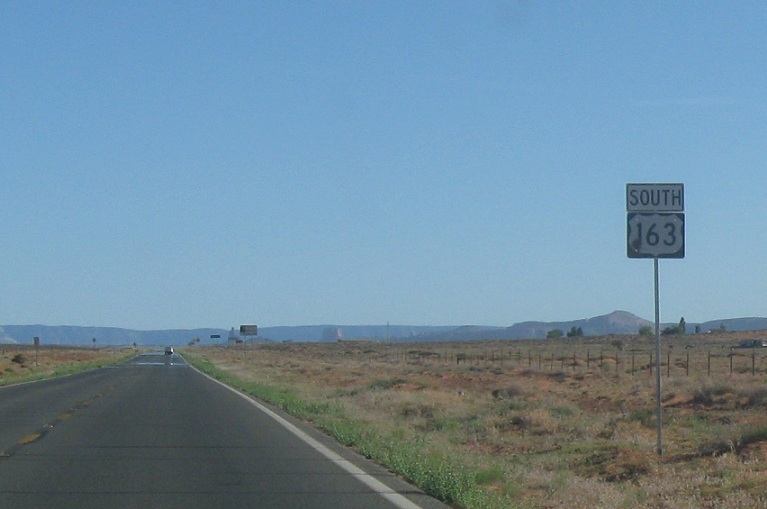 First reassurance shield as we enter the state. 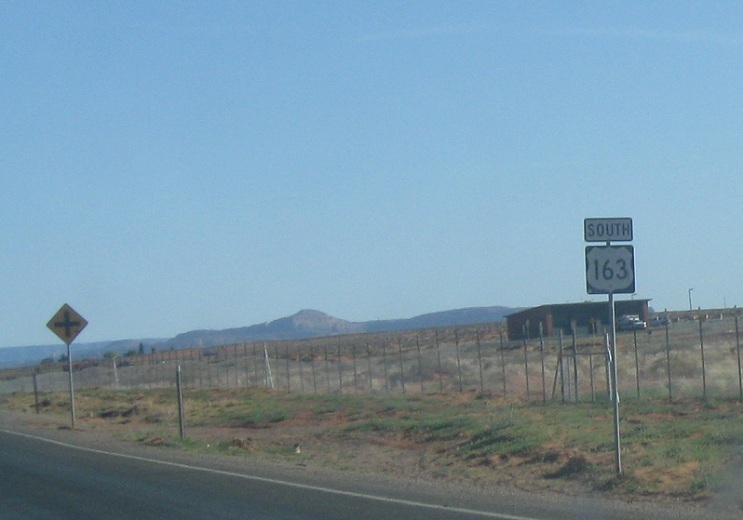 (Kayenta, AZ) Final 163 shield in Utah, Welcome to Arizona!, first 163 shield in Arizona, approaching 163 north from 160 east, there’s an error shield. 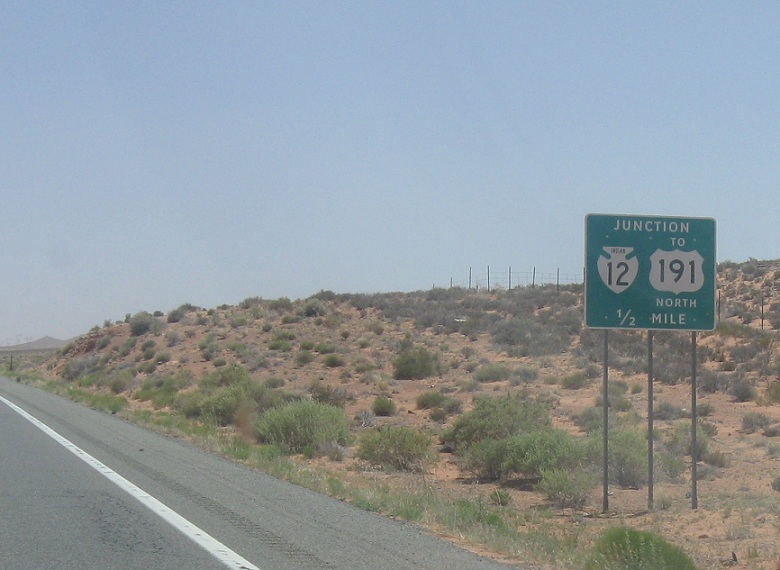 (Mexican Water, AZ) Indian Rte 12 takes the route of 191 from its split with 160 east in Arizona, follow 191 north to Utah and 160 east to Colorado, US-191 is Indian 12, Indian 12 reassurance shield, Welcome to Utah!, 191 is again the primary route as we enter Utah. 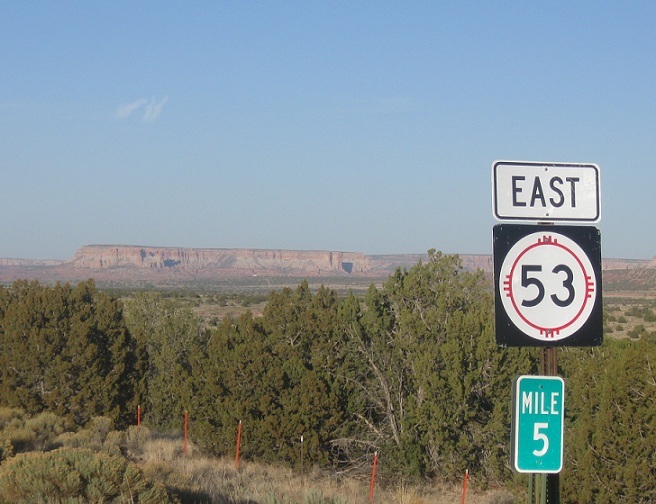 (Four Corners, NM) From the 191 north split follow 160 to Colorado, POE sign in Teec Nos Pos at the 64 split, no signage as we enter New Mexico as the stay is very brief, as we enter New Mexico we approach 597, which is the only junction in the state. 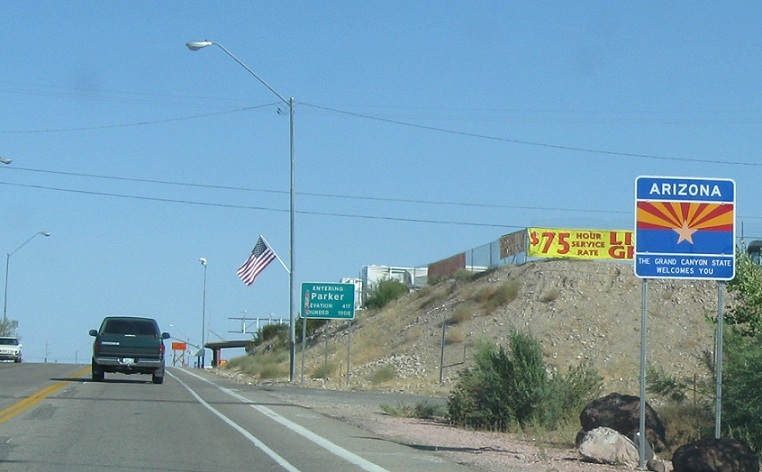 (Teec Nos Pas, AZ) Reassurance shield at the beginning of 64, welcome to New Mexico!, welcome to New Mexico again!, sign in Navajo on 64 west as we leave New Mexico, 64 west as we enter Arizona, Welcome to Arizona!, 64 ends at the 160 junction. 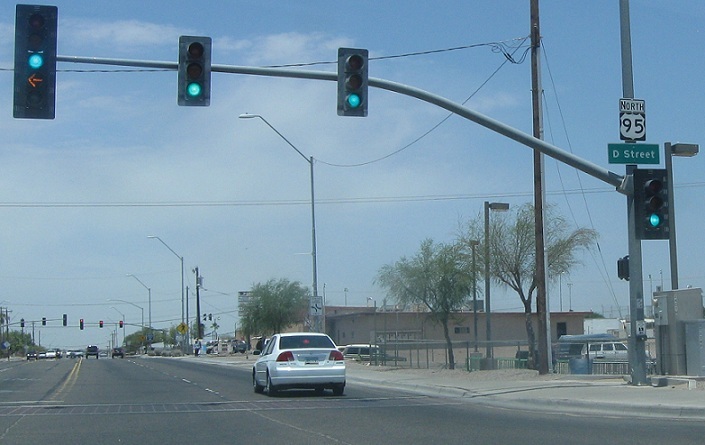 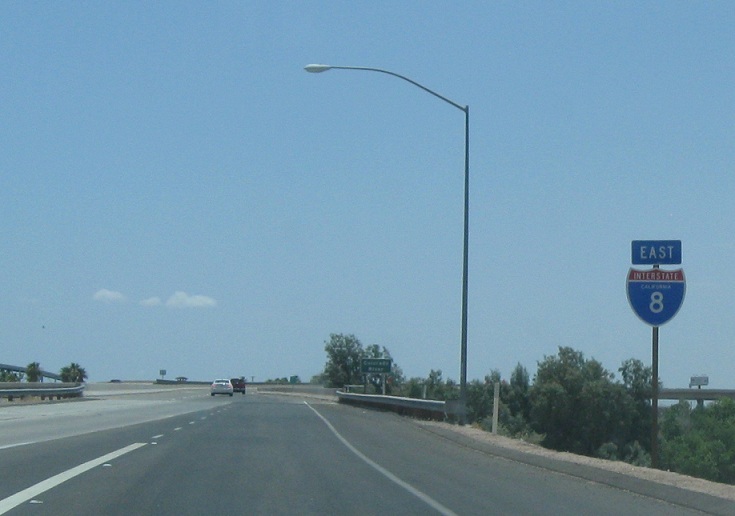 (Lupton, AZ) The Grants Rd exit is right at the Arizona line. 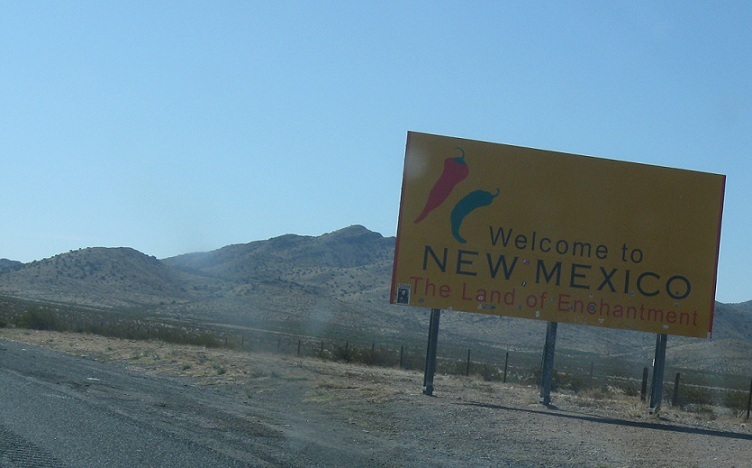 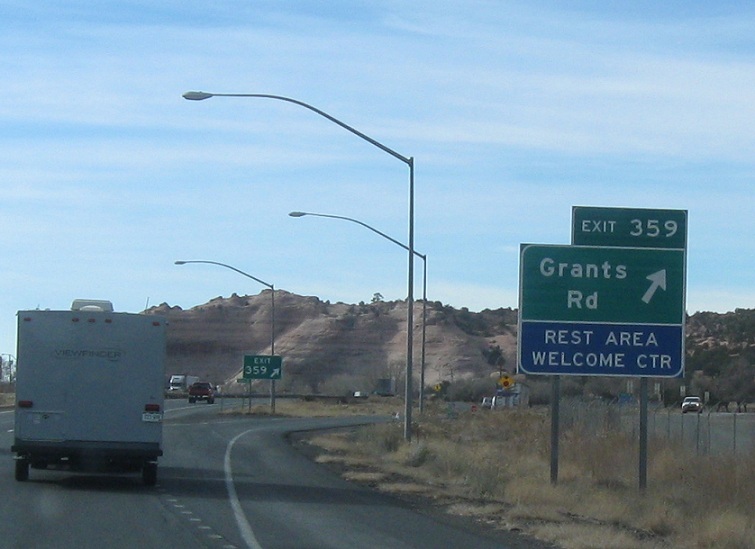 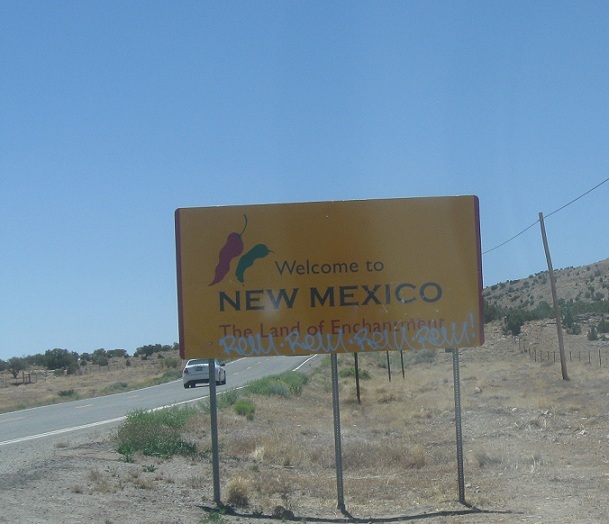 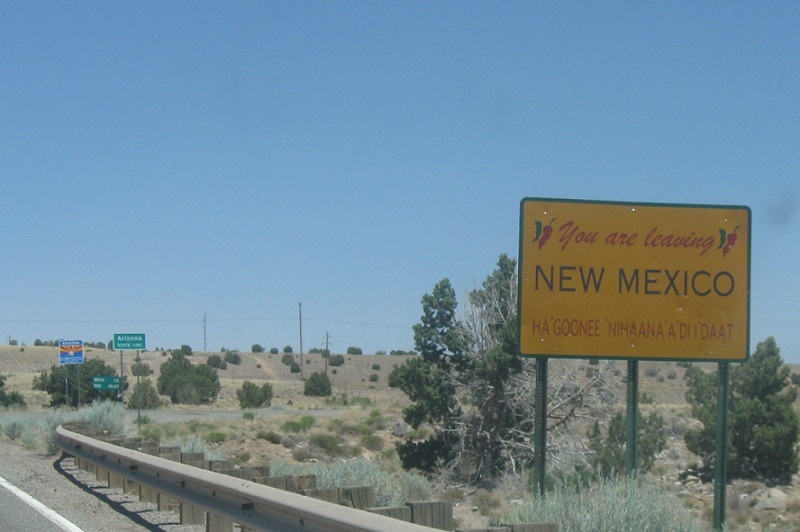 Advance signage is in New Mexico. 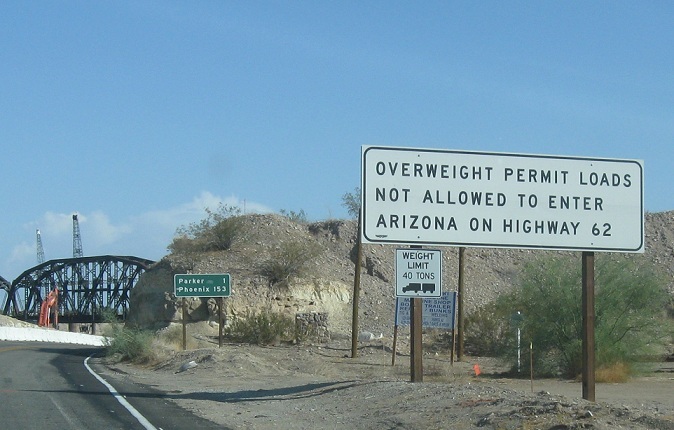 Welcome to Arizona! 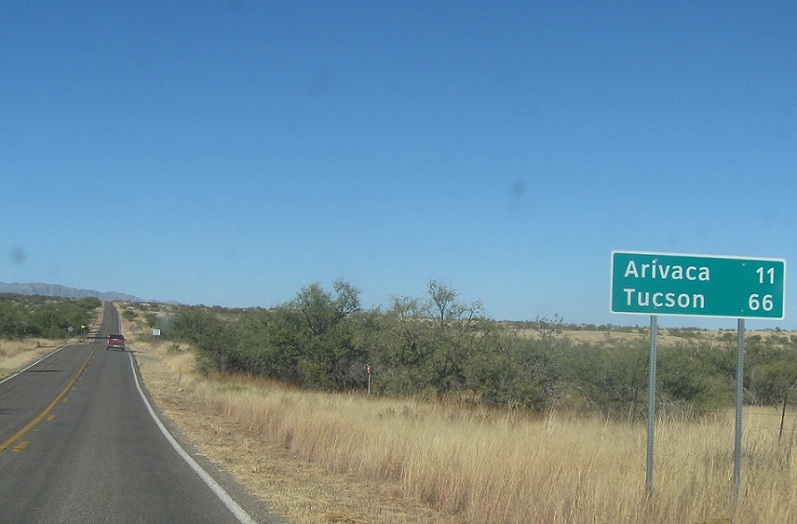 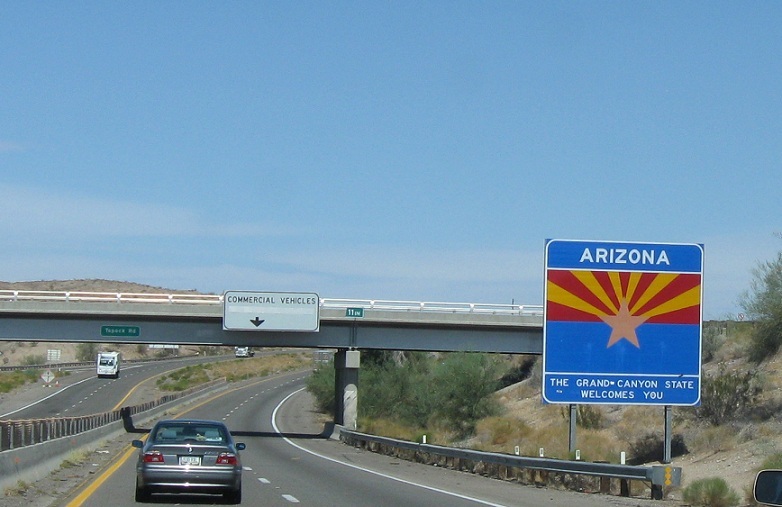 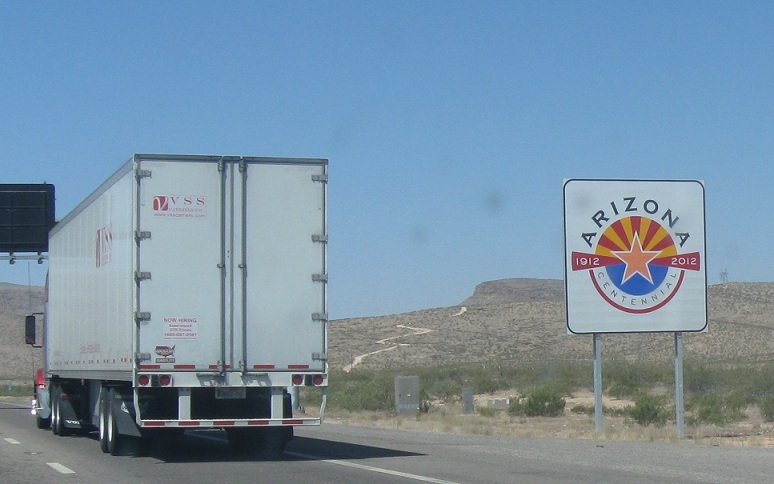 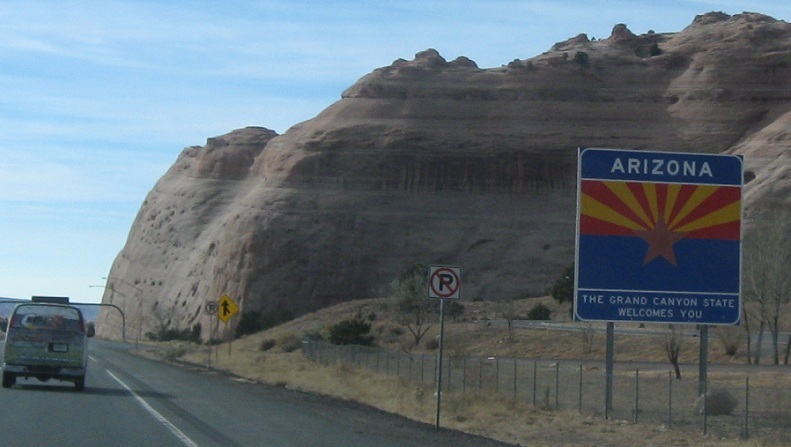 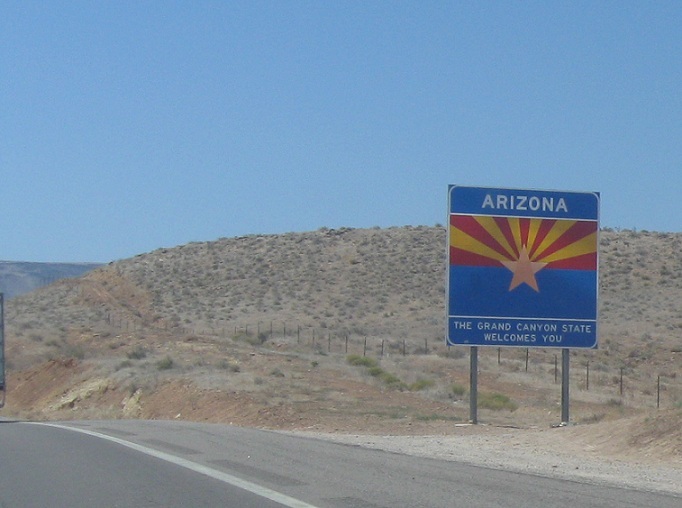 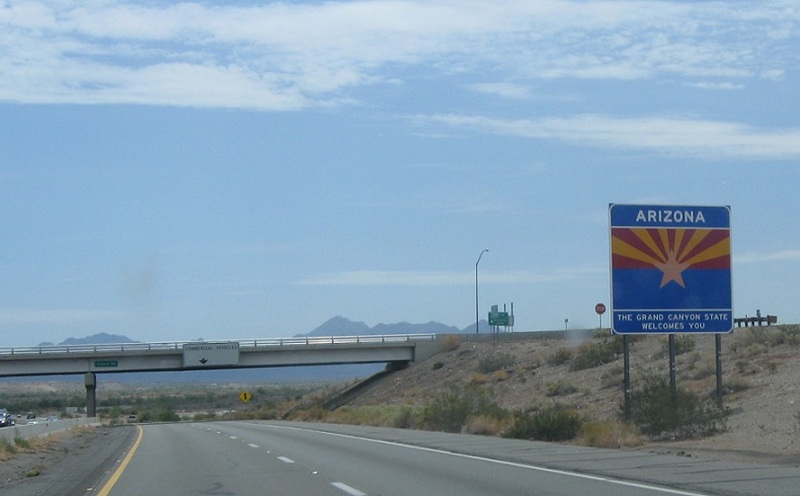 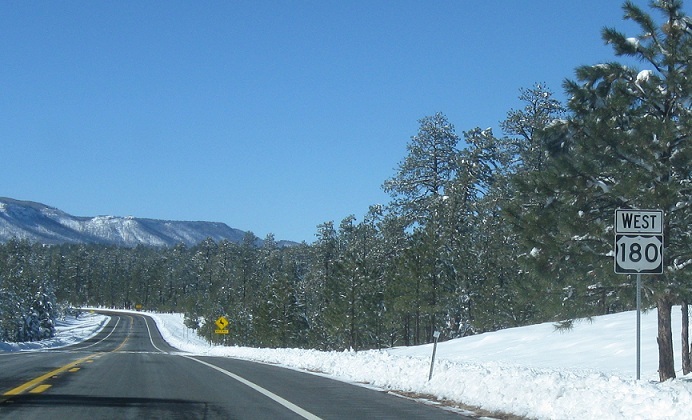 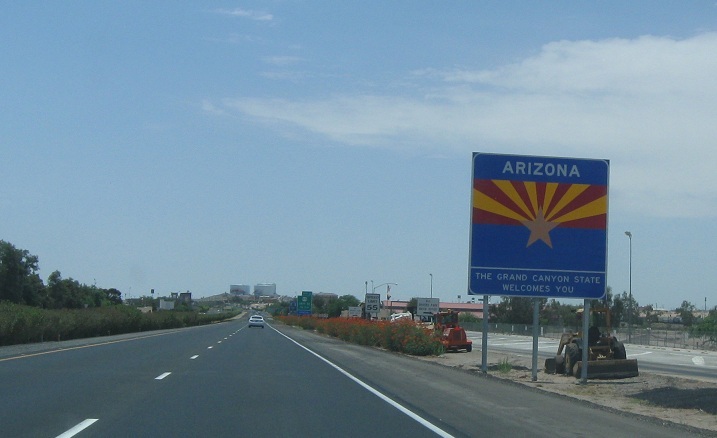 First Arizona reassurance shield. 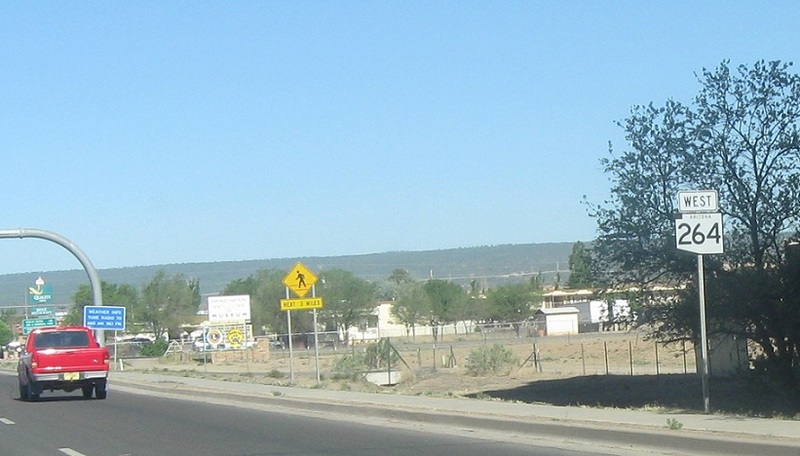 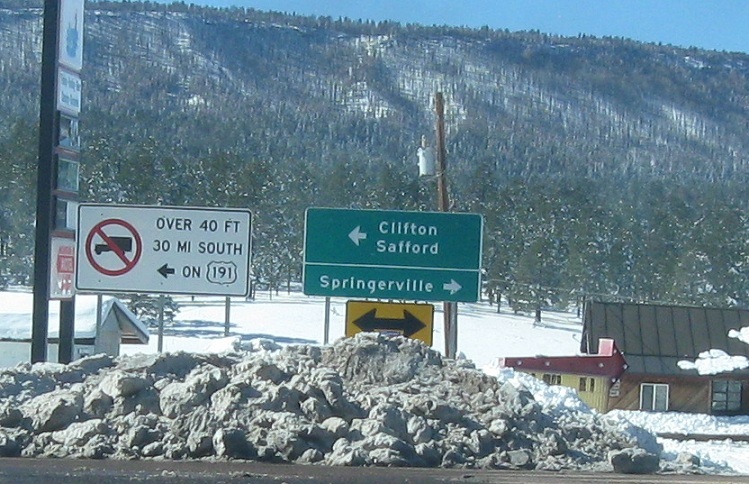 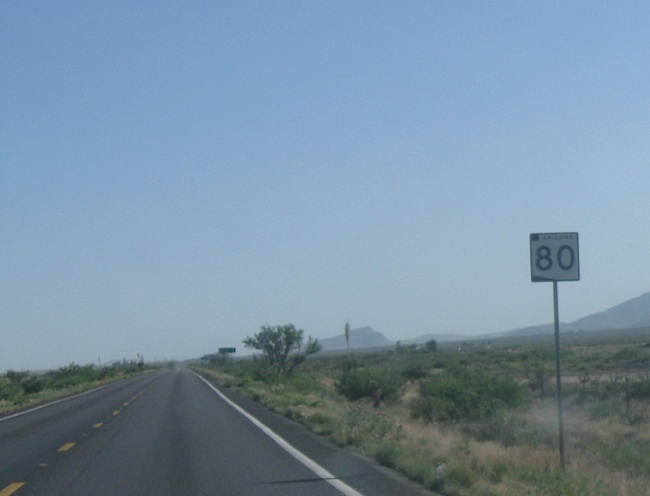 (Springerville, AZ) Welcome to Arizona!, first US-60 shield in Arizona. 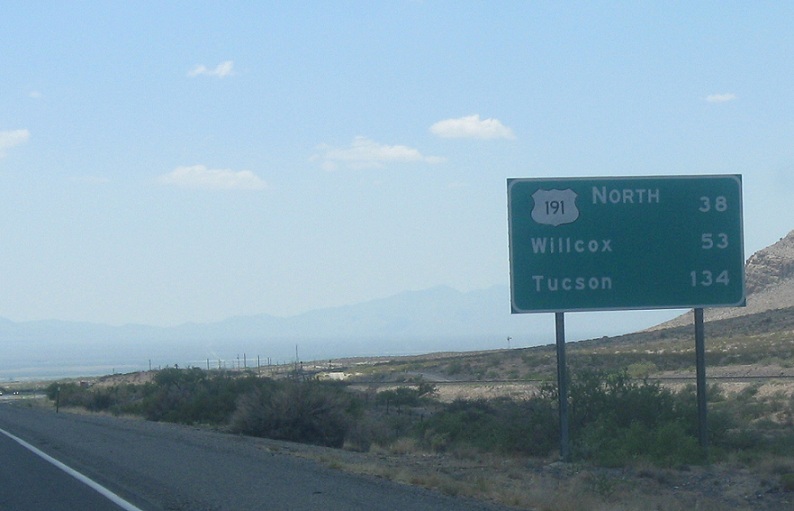 (Alpine, AZ) Final New Mexico reassurance shield, Welcome to Arizona!, first AZ reassurance shield, a few miles into Arizona, 180 approaches US-191. 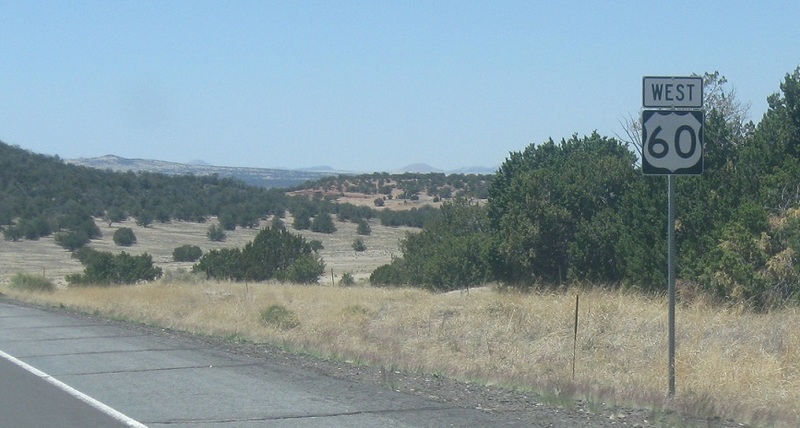 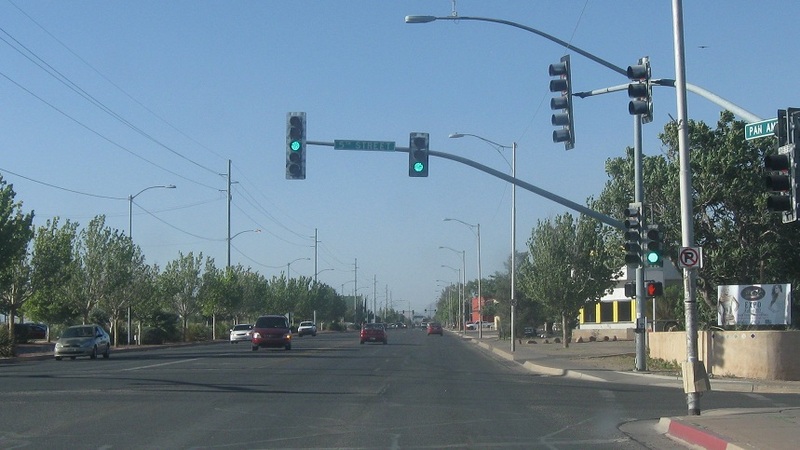 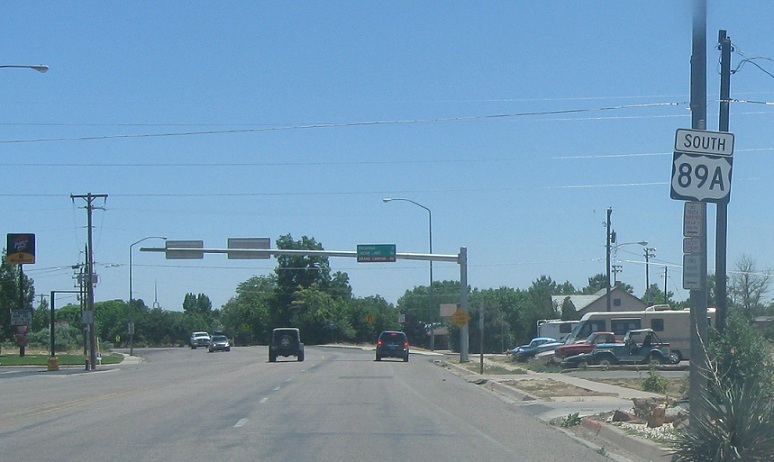 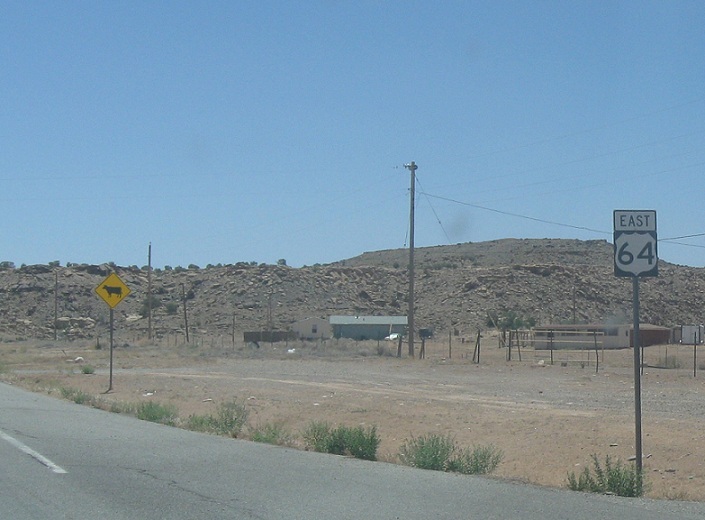 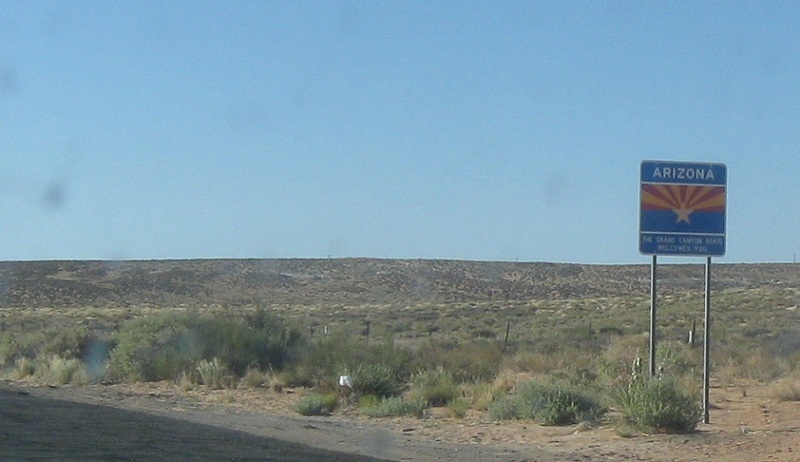 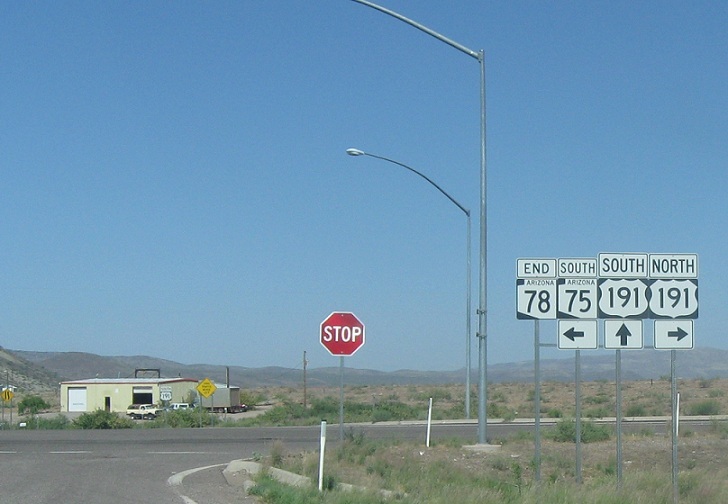 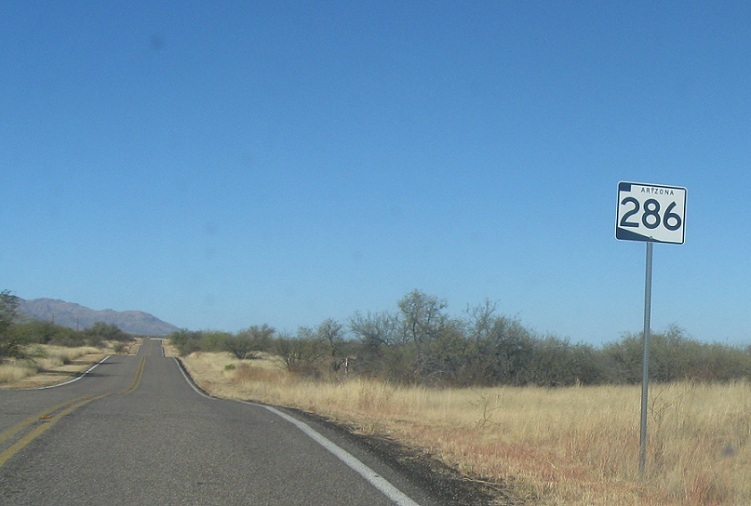 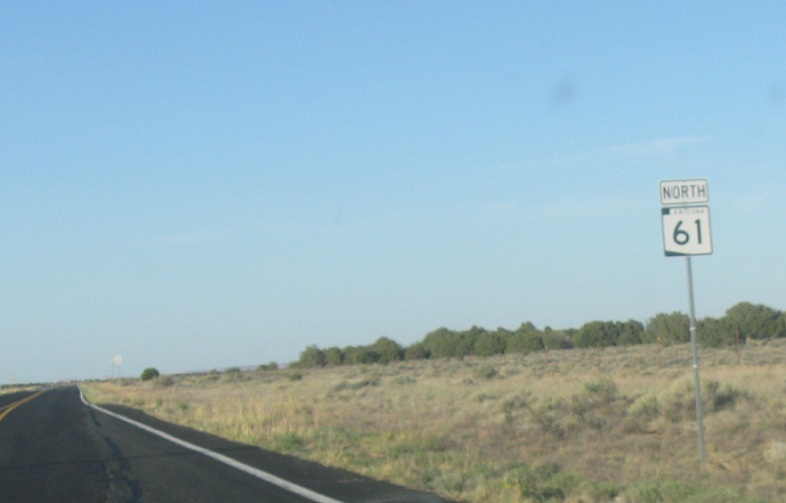 (Three Way, AZ) First and last SR-78 shield in New Mexico, Welcome to Arizona!, Last and only 78 shield in Arizona at its end at the Four Corners junction. 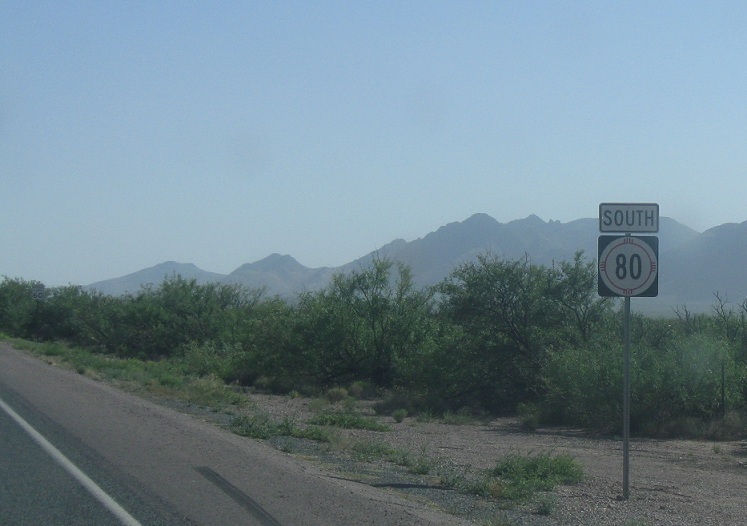 (Rodeo, NM) Final SR-80 shield, Welcome to Arizona!, first SR 80 shield. 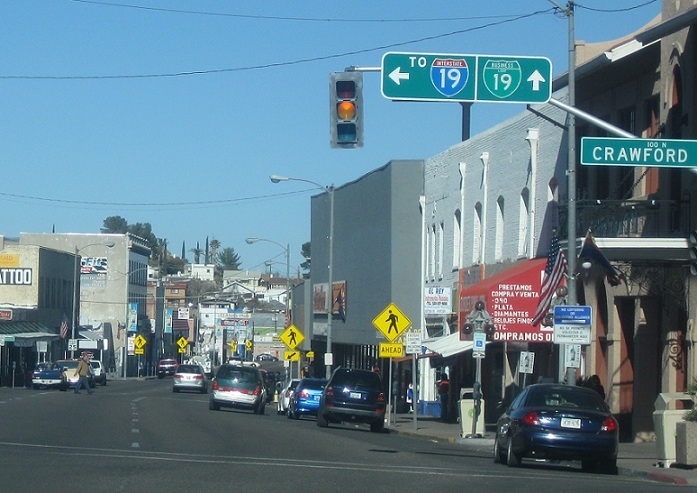 (Douglas, AZ) The beginning of 191. 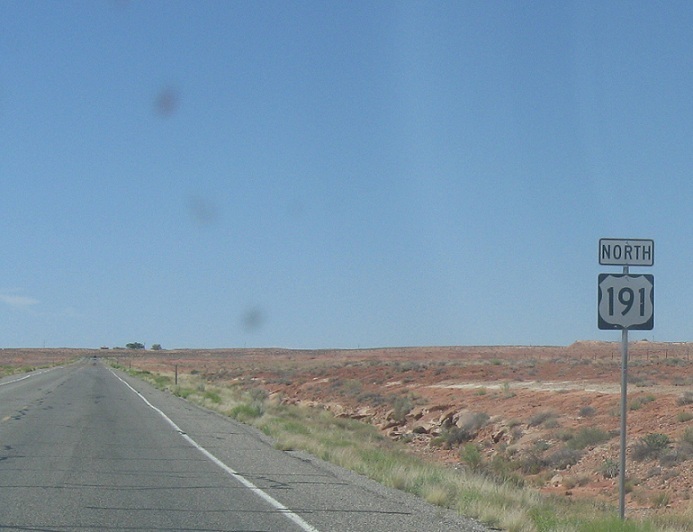 No signage. 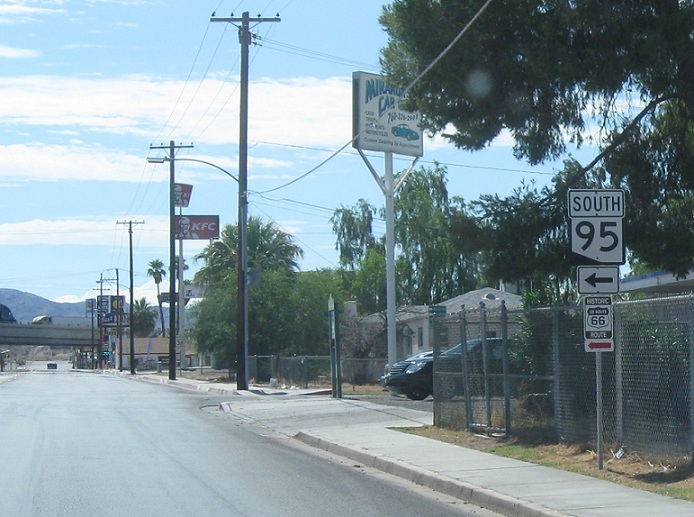 A few blocks later, we approach SR 80. 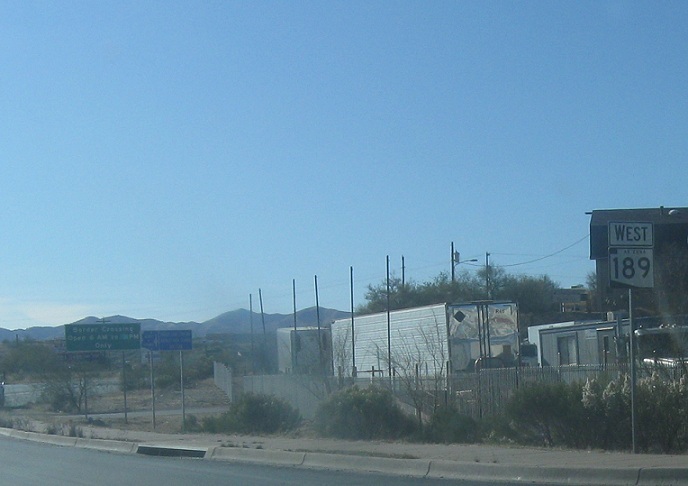 (Nogales, AZ) I-19 Business begins at the Mexican line and quickly approaches I-19, I-19 itself is signed in metric all the way to Tucson. 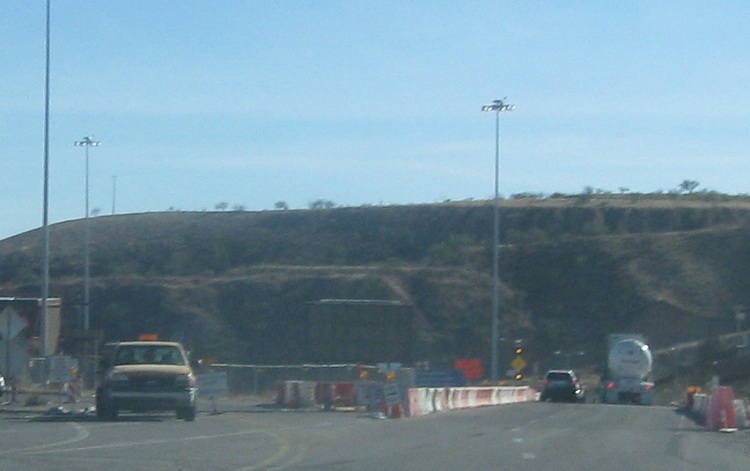 (Nogales, AZ) Final 189 shield, the tank truck in the distance is stopped at the border. 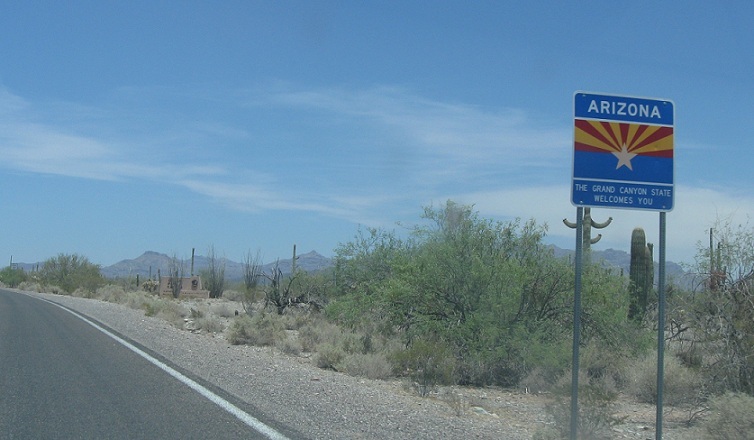 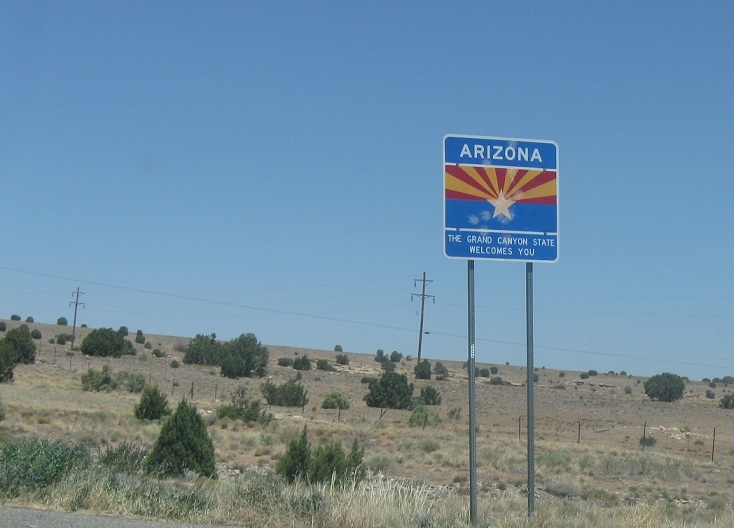 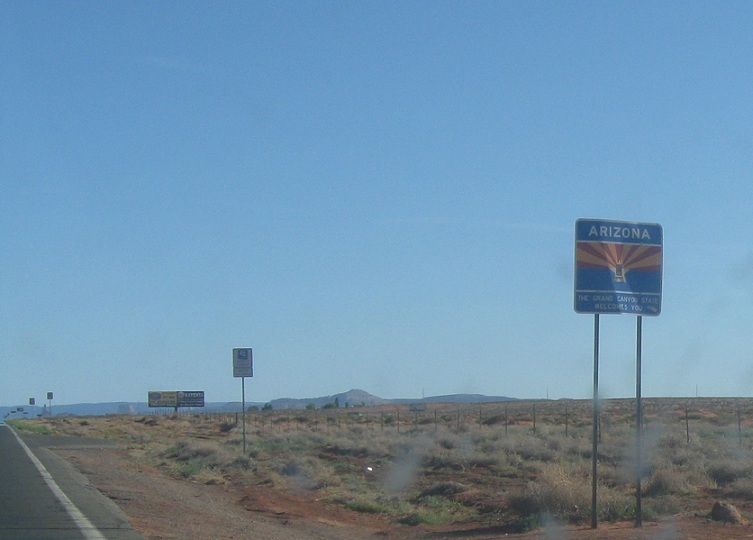 (Lukeville, AZ) First reassurance shield as we enter Arizona, Welcome to Arizona! 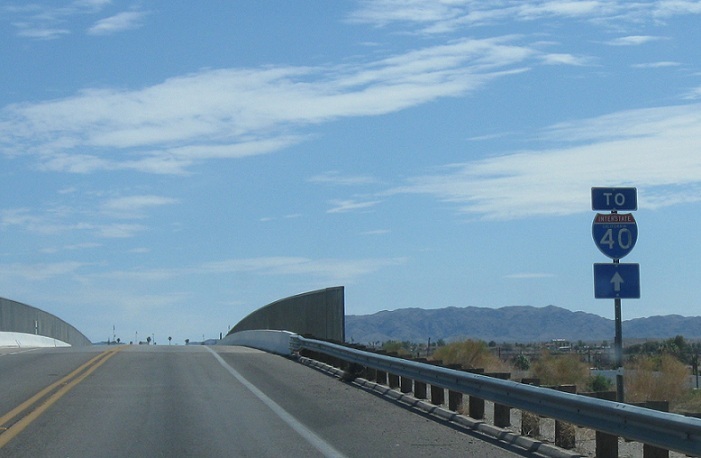 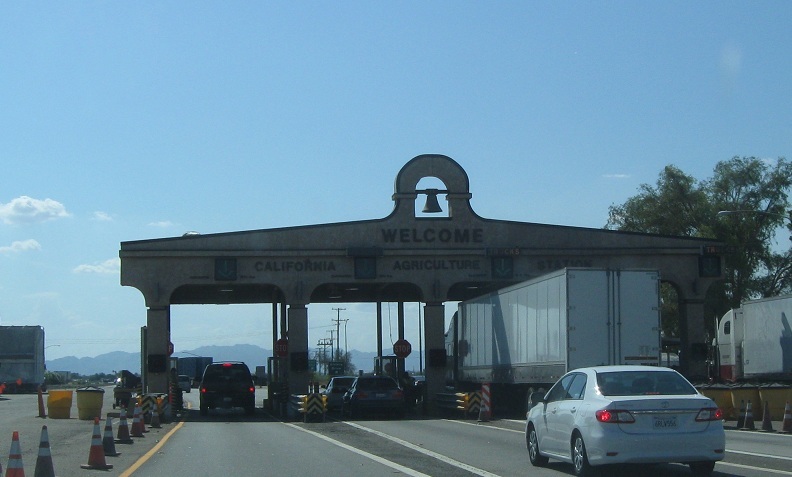 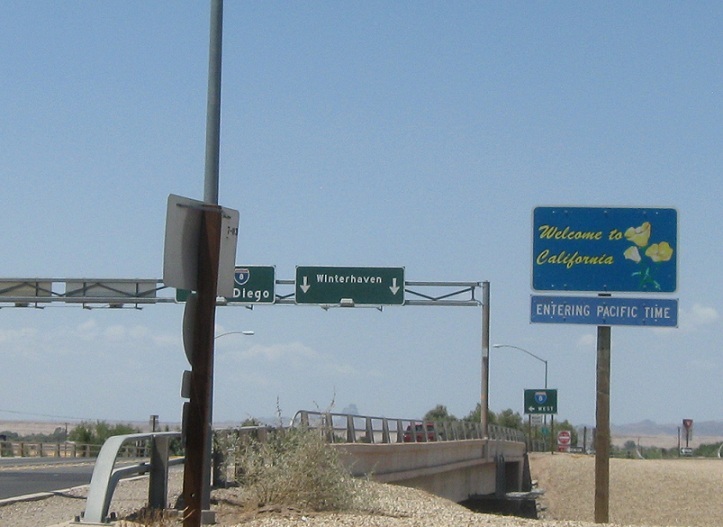 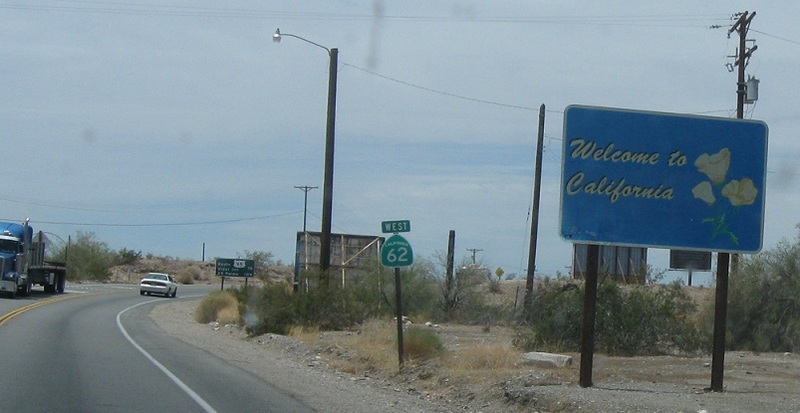 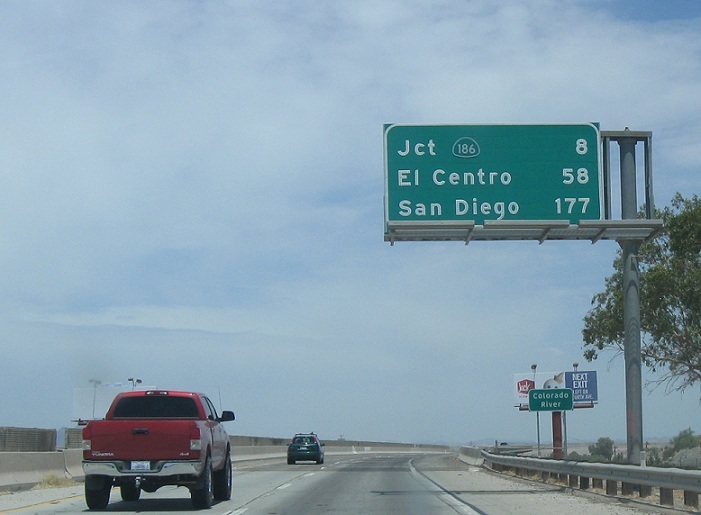 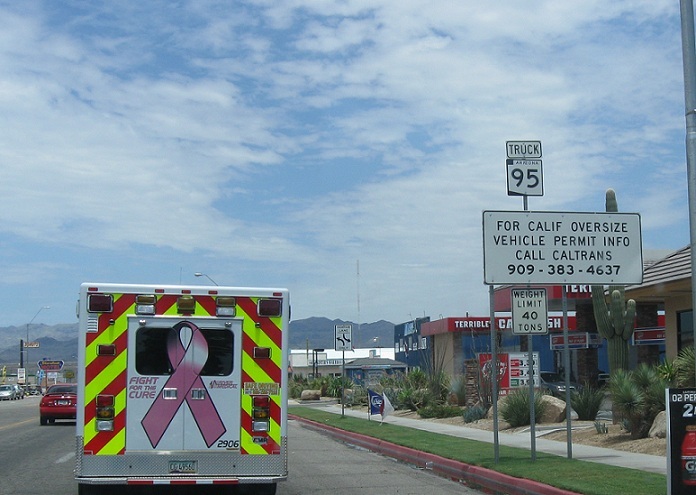 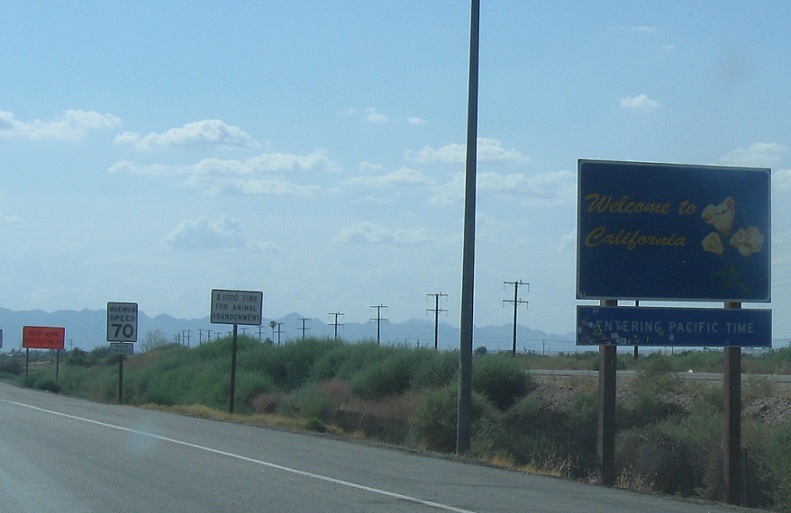 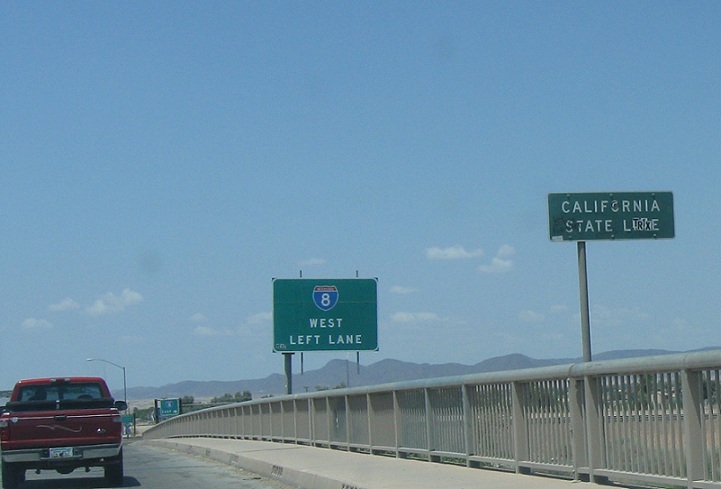 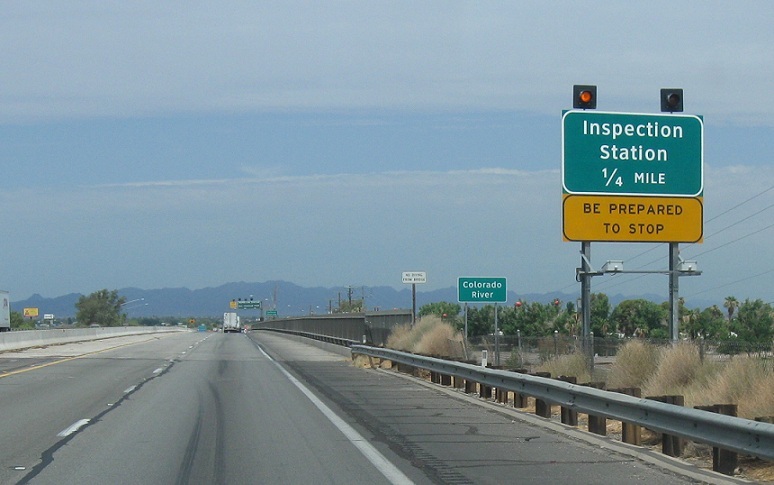 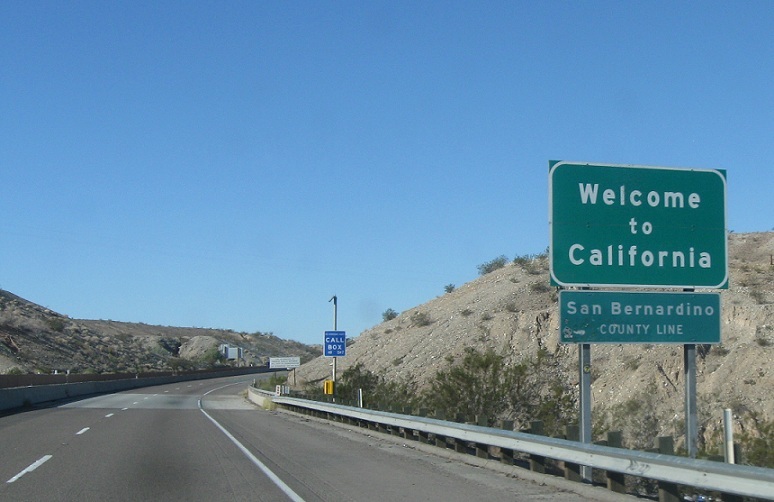 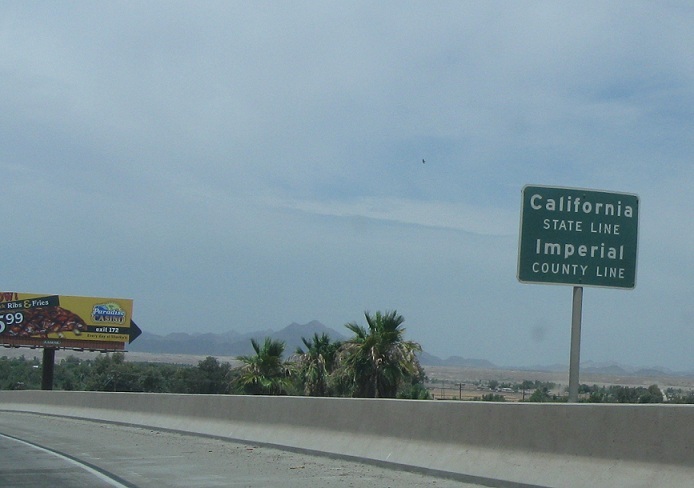 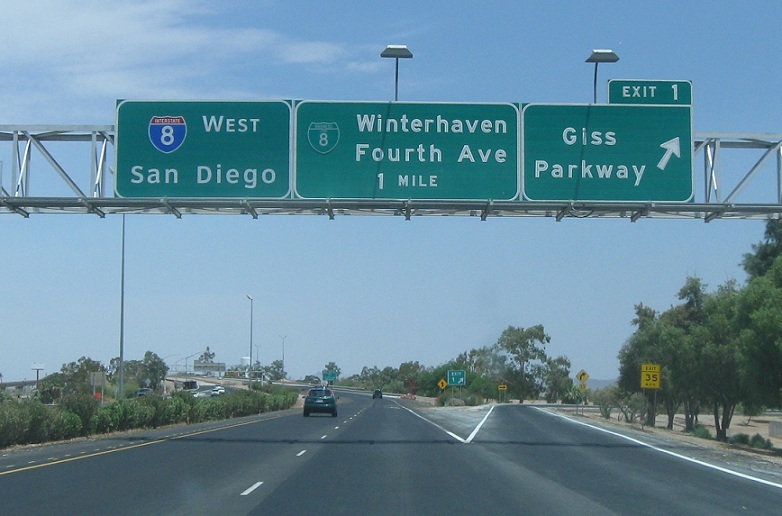 (Yuma, AZ) On the loop, we’ll start to get some reassurance shields for I-8 with the wrong state name, final reassurance shield before the bridge, just before the bridge, we’re finally directed to I-8 in California, California line, Welcome to California! 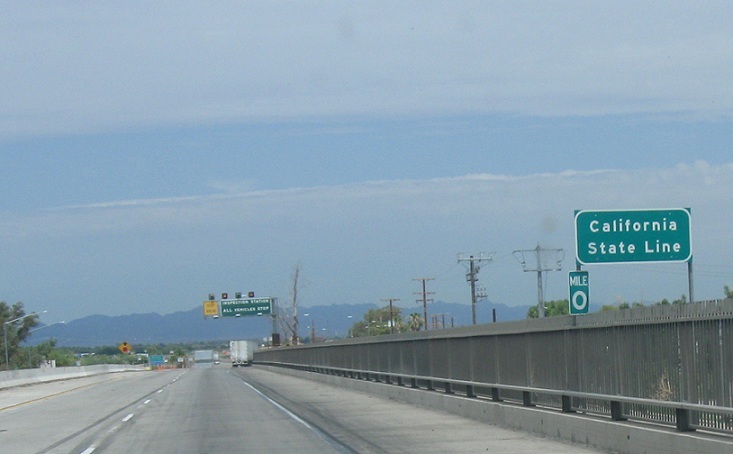 I-8 business ends at the state line since Caltrans doesn’t do business loops unless they happen to run with state highways. 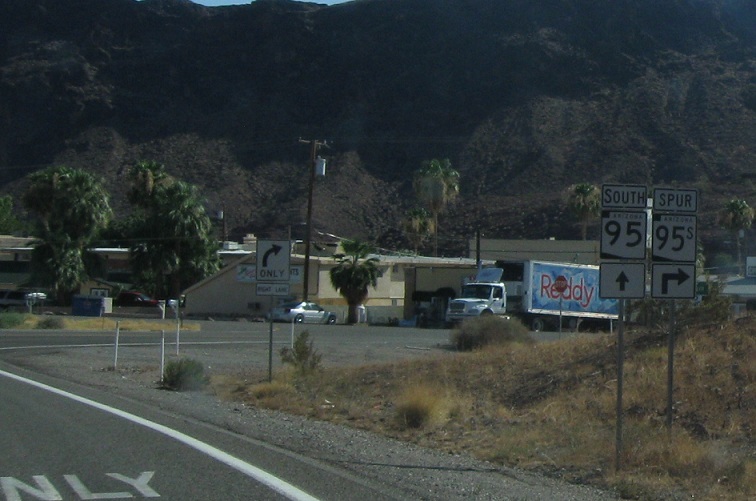 (Parker, AZ) From mainline 95 north SR 95 spur is just signed as CA-62, 95 Spur itself is signed as 95 truck for some reason, and then when it ends it’s just signed as mainline 95, CA State Line, Follow CA-62 to US-95, Welcome to California! 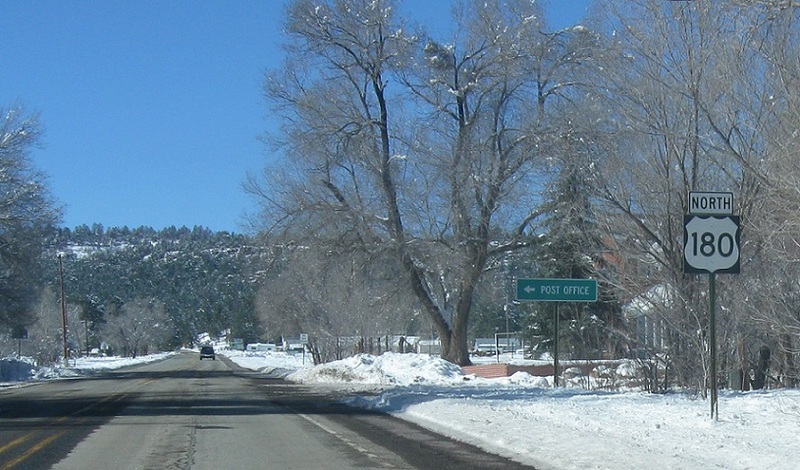 after the turn. 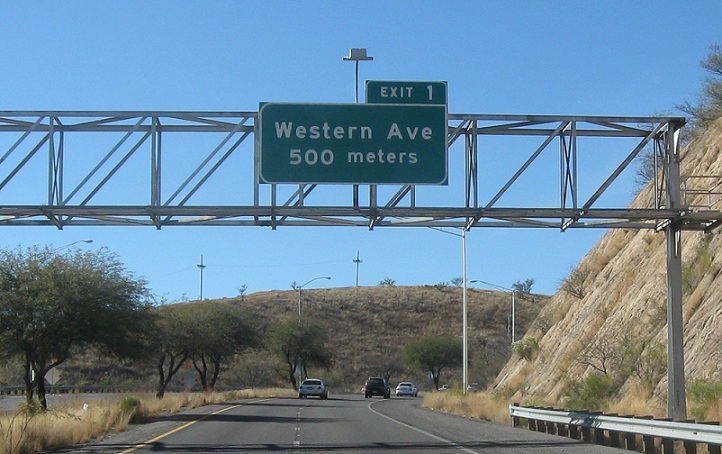 From 62/95 spur east, Phoenix is a control city for 62 which is neat, overweight loads shouldn’t take this route to Arizona, 62 ends at the bridge, Welcome to Arizona! 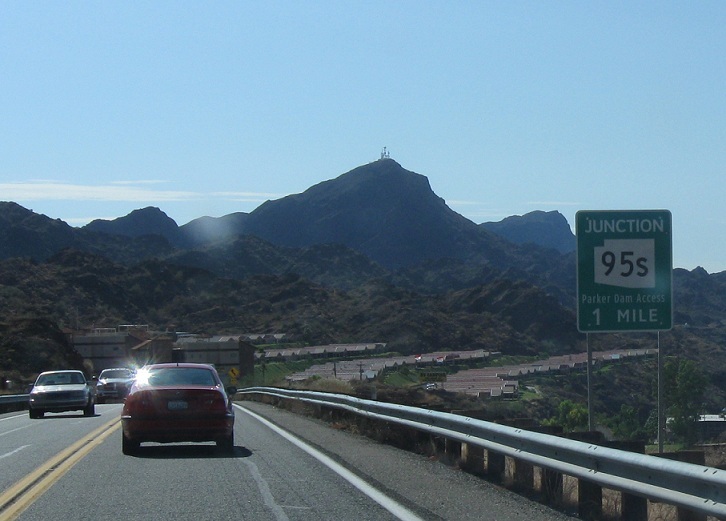 (Parker Dam, AZ) From 95 south, junction 95 Spur, turn right for 95 spur. 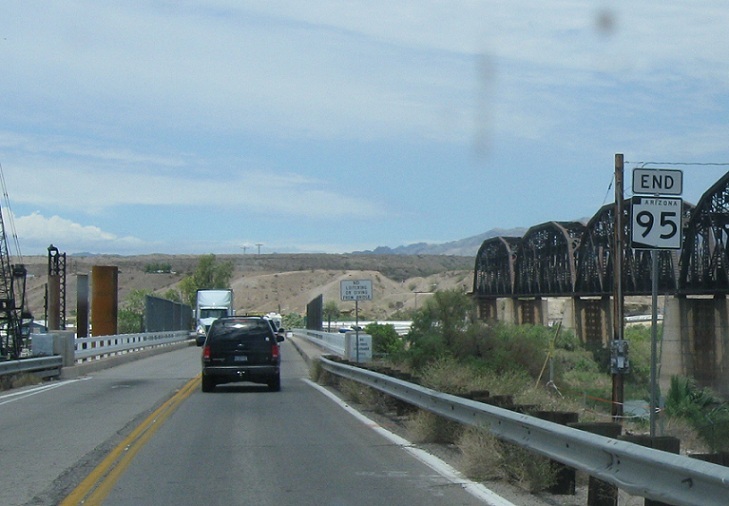 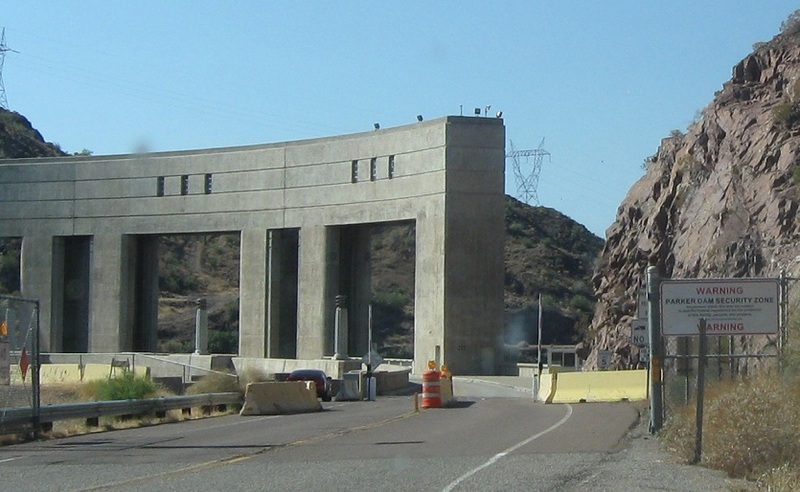 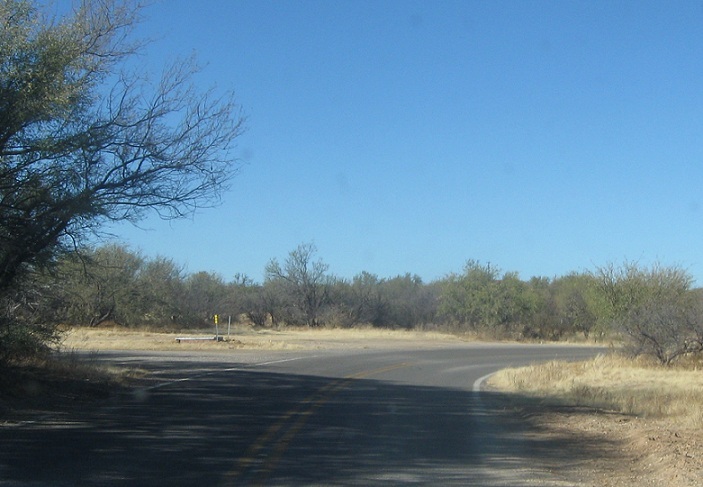 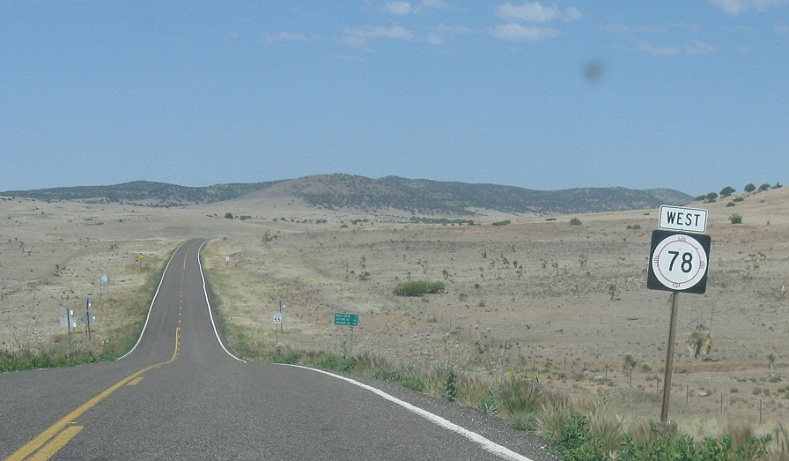 From 95 Spur, it quickly ends at Parker Dam. 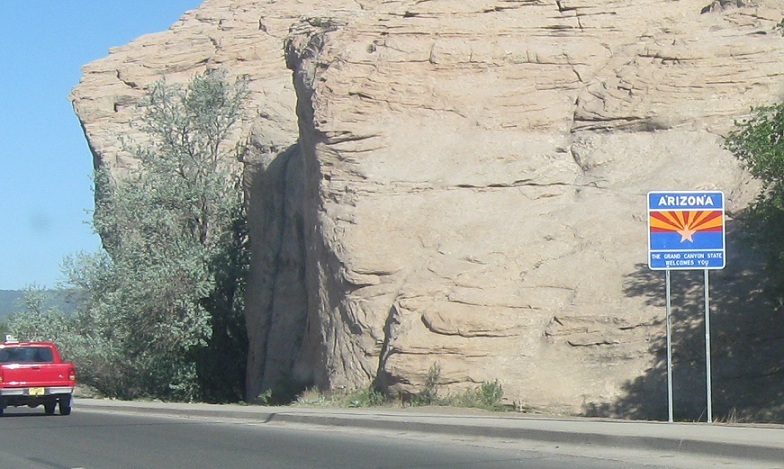 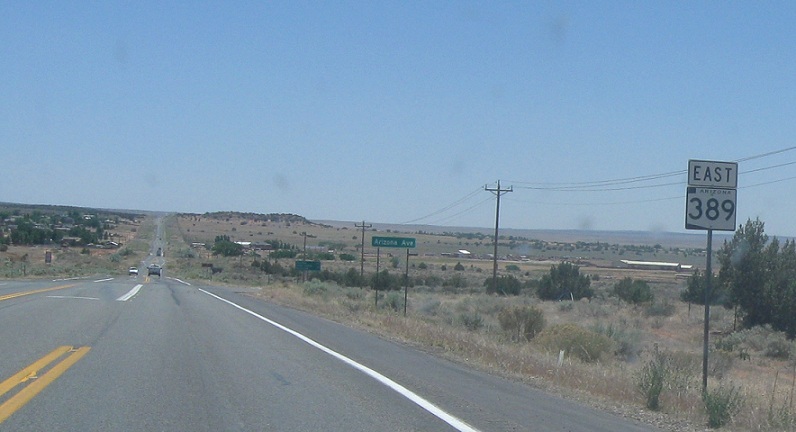 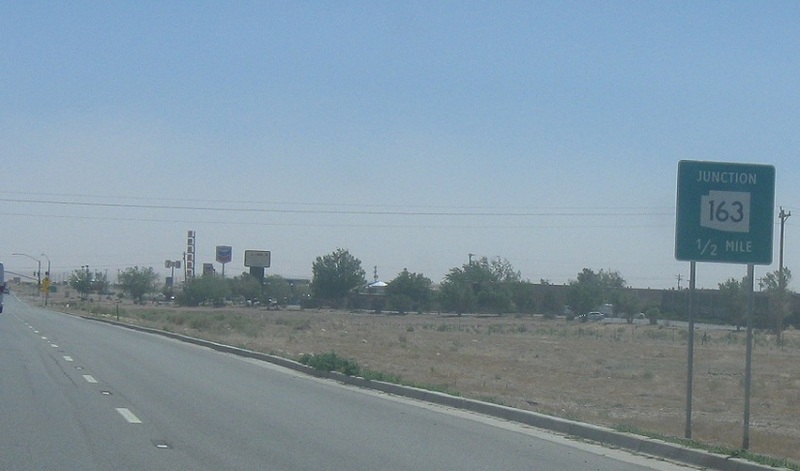 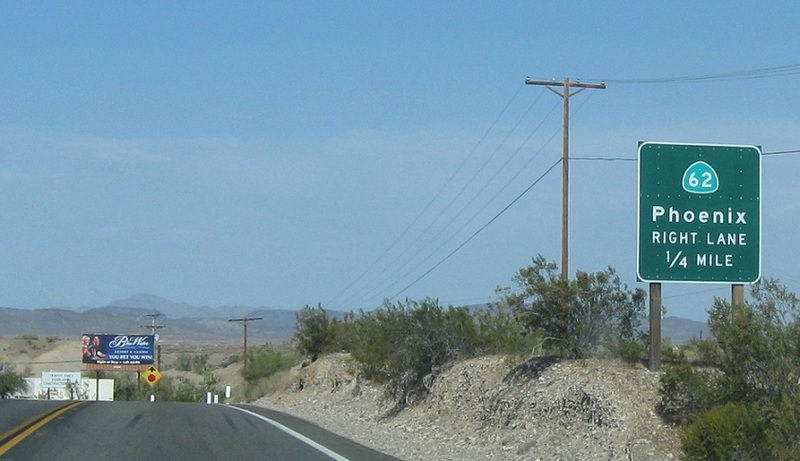 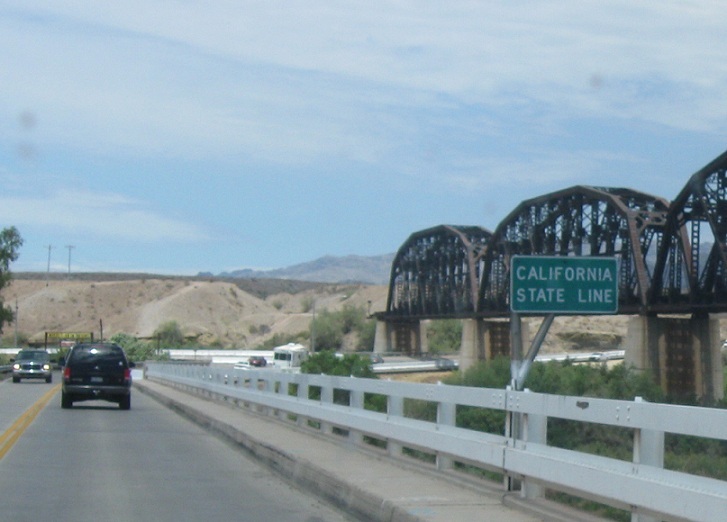 Cross this road into California, where it does not continue as a state highway. 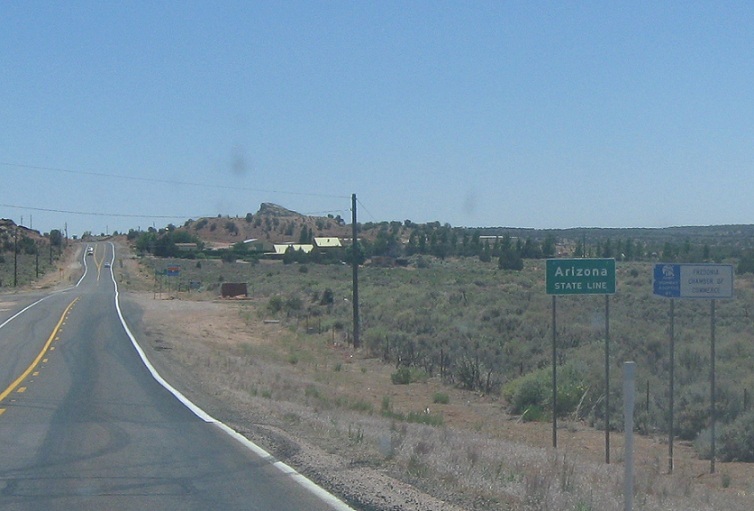 (Topock, AZ) Final reassurance shield before we enter California, Welcome to California!, Reassurance as we enter California. 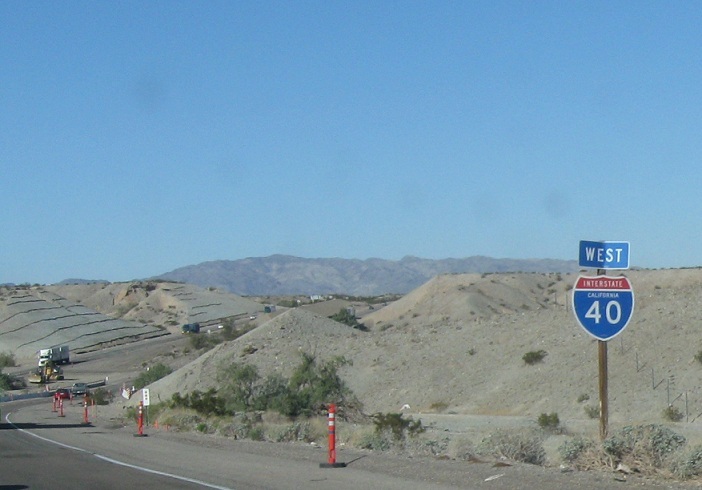 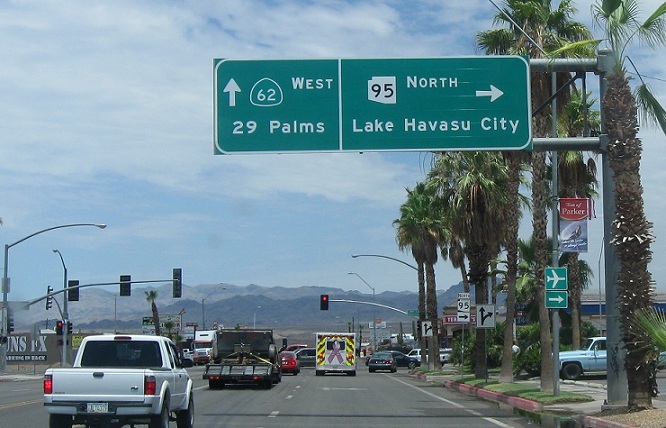 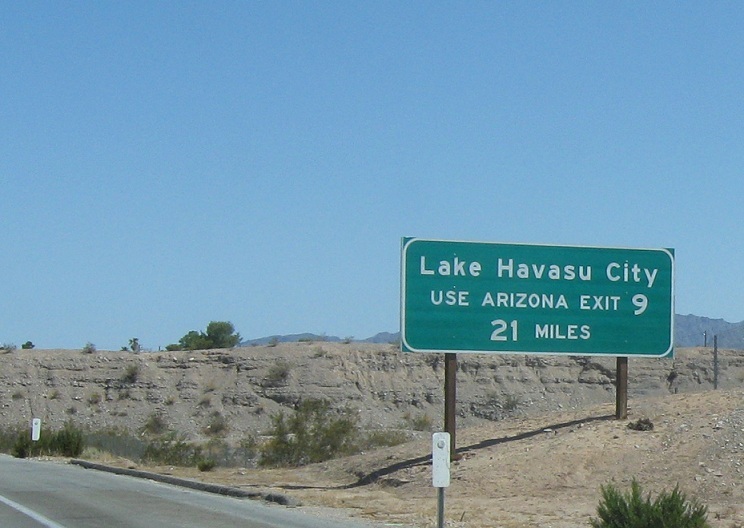 From I-40 east, in Needles we’re advised to stay on I-40 for Lake Havasu city without mentioning AZ-95, US-95 exits in California, advance signage for Arizona 95 in California, advance signage for Arizona exit 1, more for Arizona exit 1, final approach signage for Arizona exit 1, AZ State Line, Welcome to Arizona! 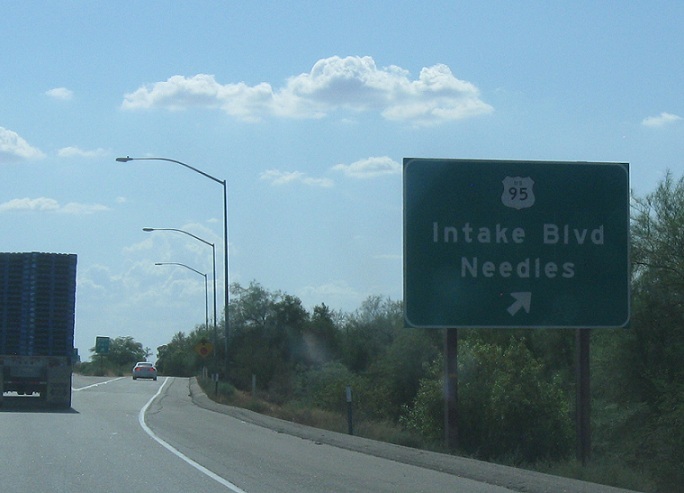 (Needles, CA) Final Arizona 95 shield, stay straight to get to I-40 in California, as we enter California on local roads turn right for I-40 and US-95, then turn left for Arizona 95 and US-95. 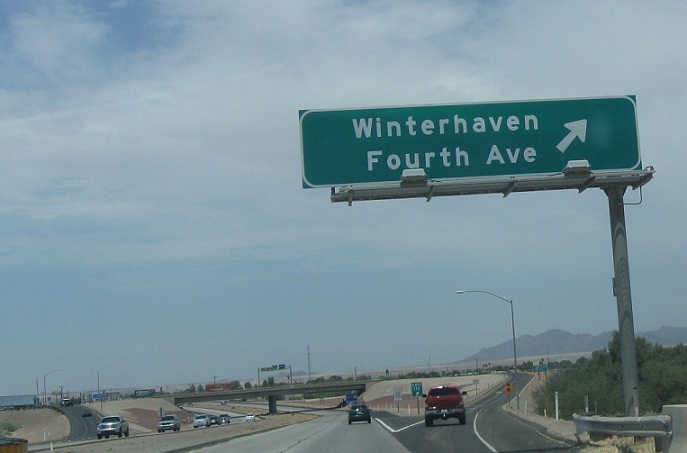 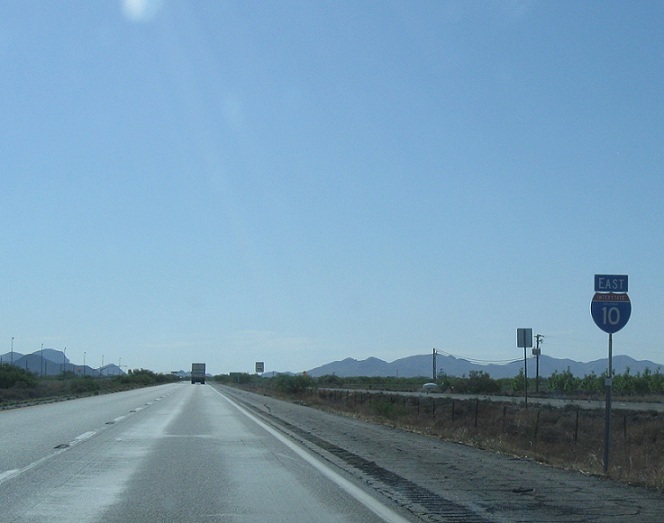 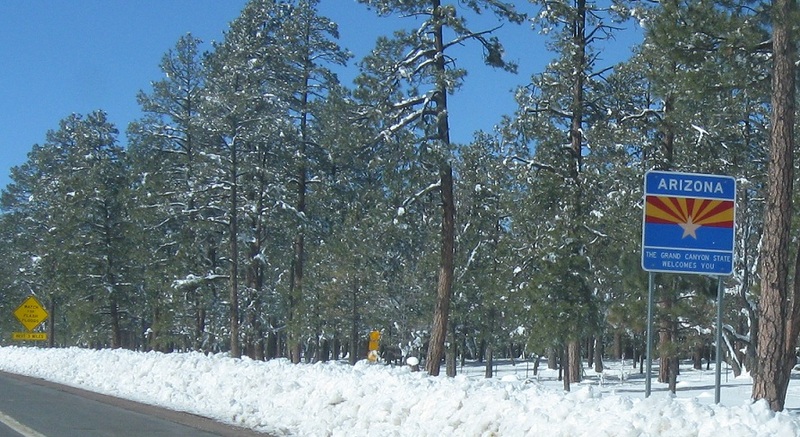 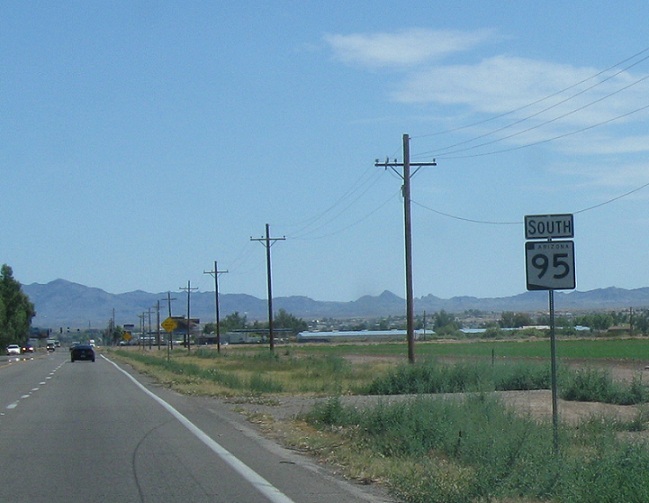 From local roads heading north in Needles, follow those signs to get to Arizona 95 north. 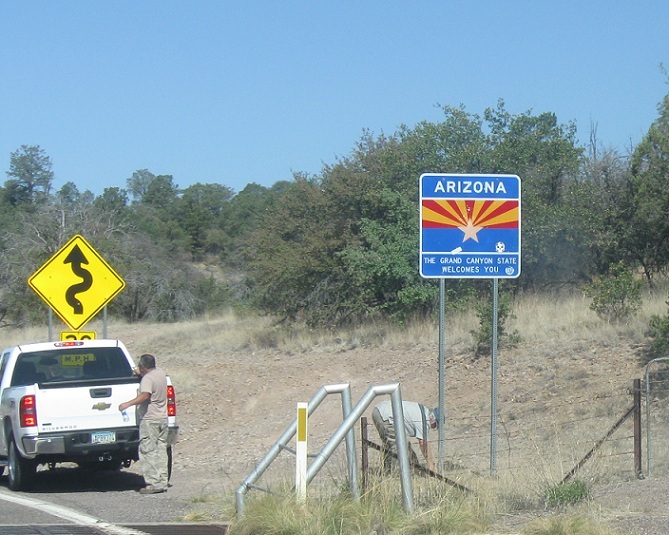 See the I-40 state line crossing above for more coverage of this unique situation. 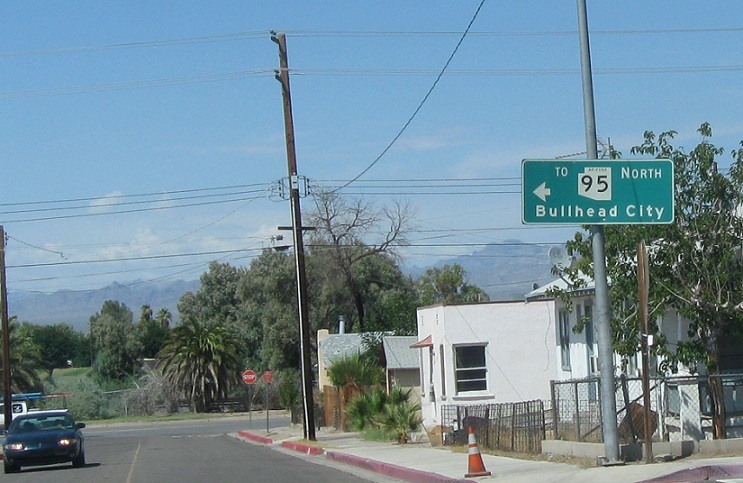 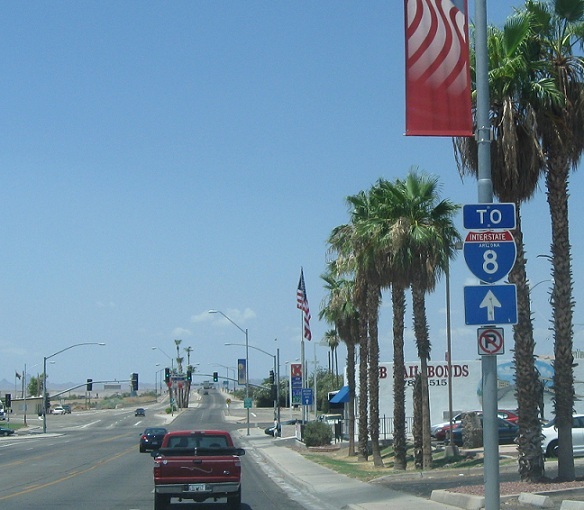 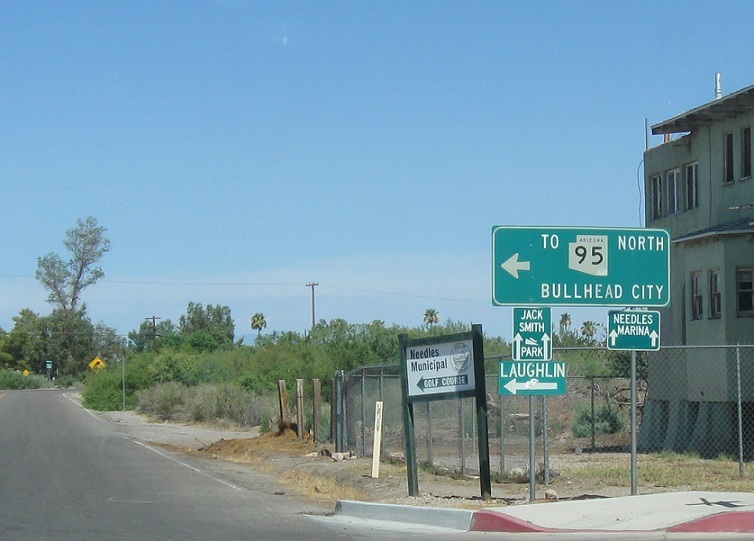 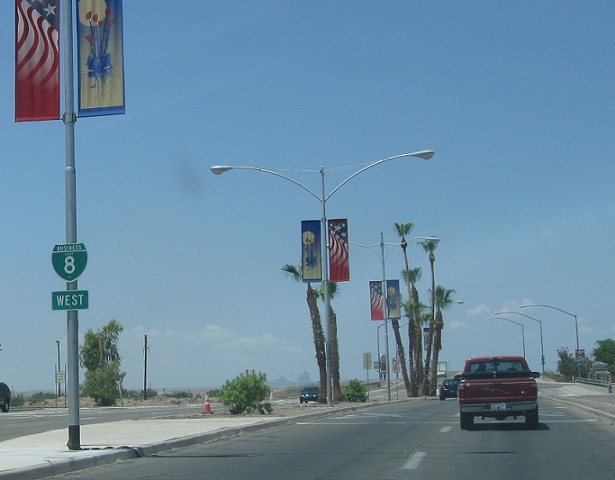 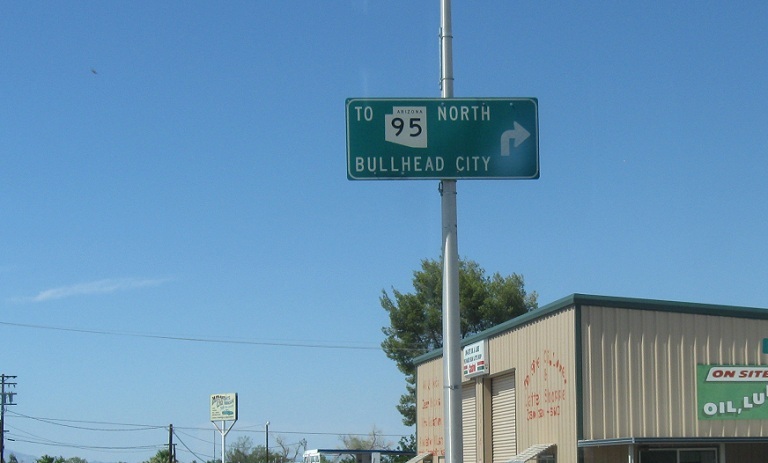 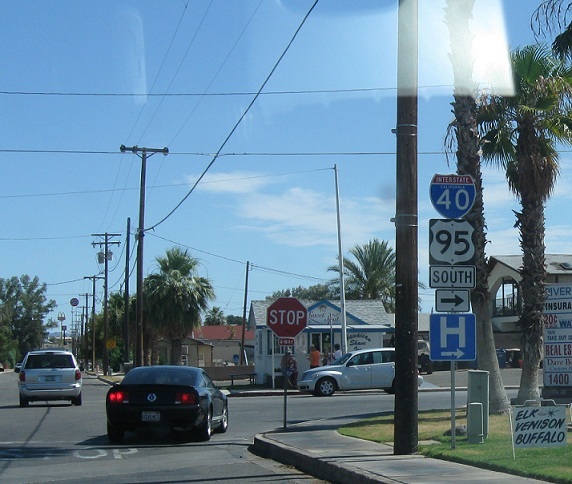 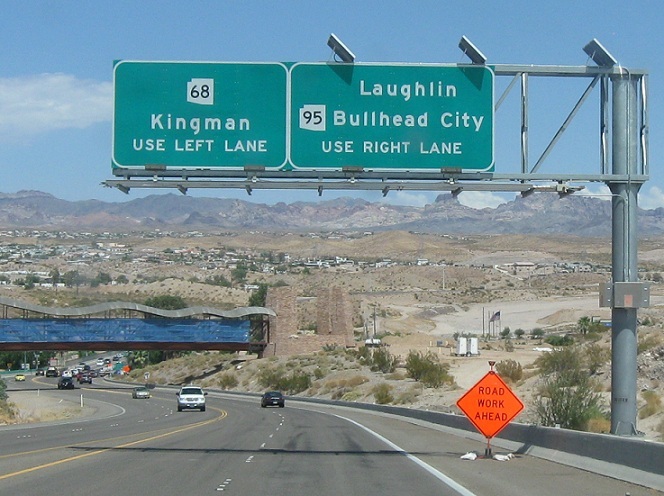 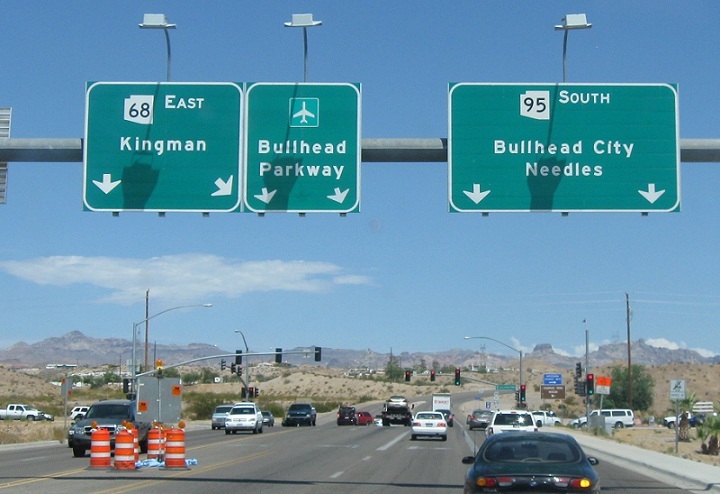 (Bullhead City, AZ) Final Nevada 163 shield, advance signage for 95 and 68 in Nevada, Welcome to Arizona!, 95 immediately intersects 68 in Arizona. 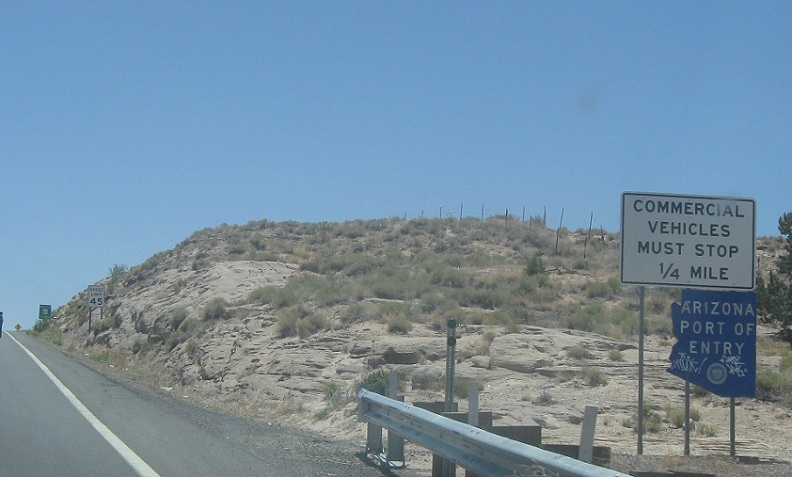 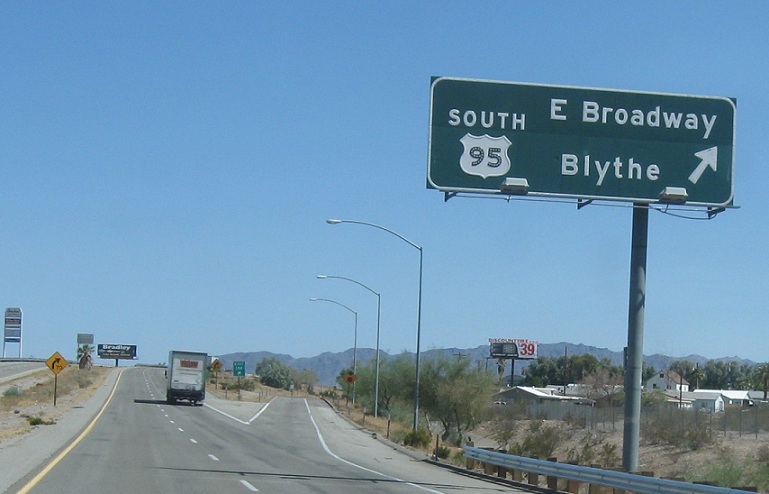 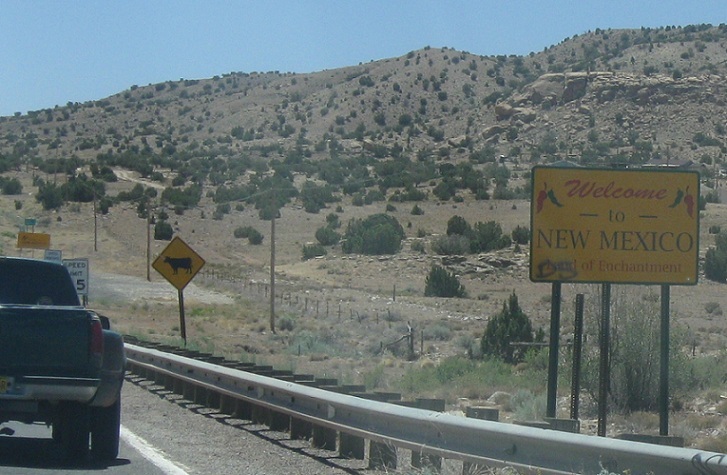 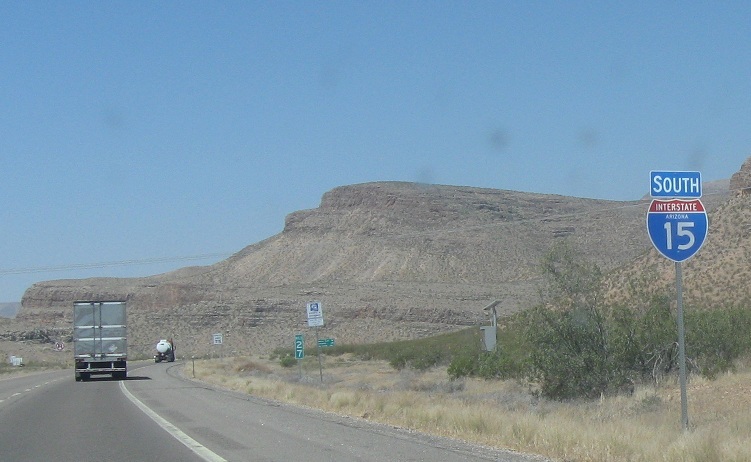 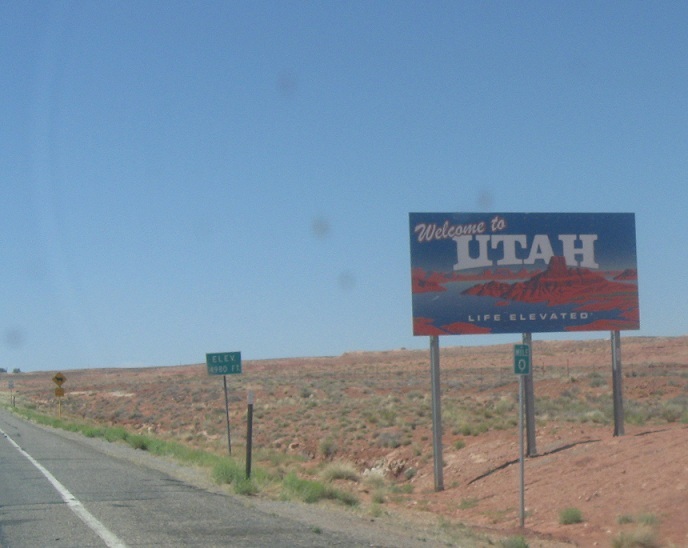 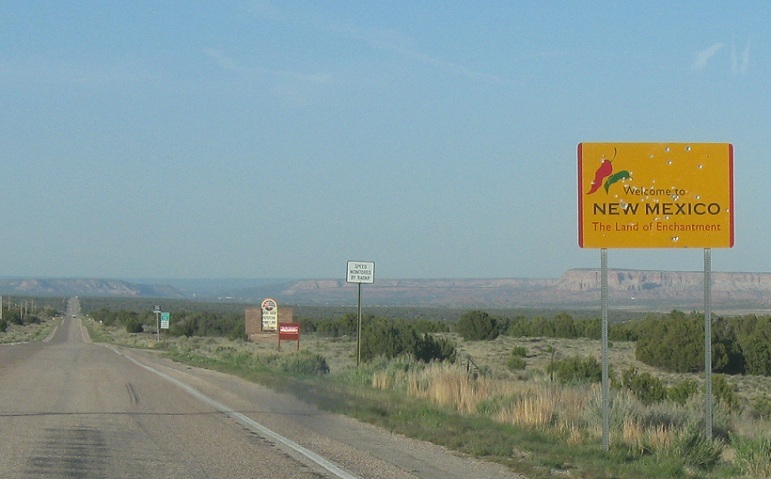 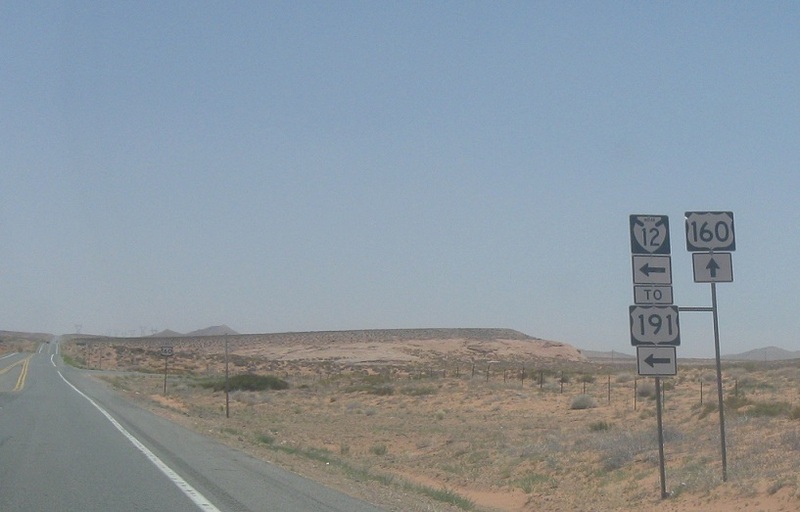 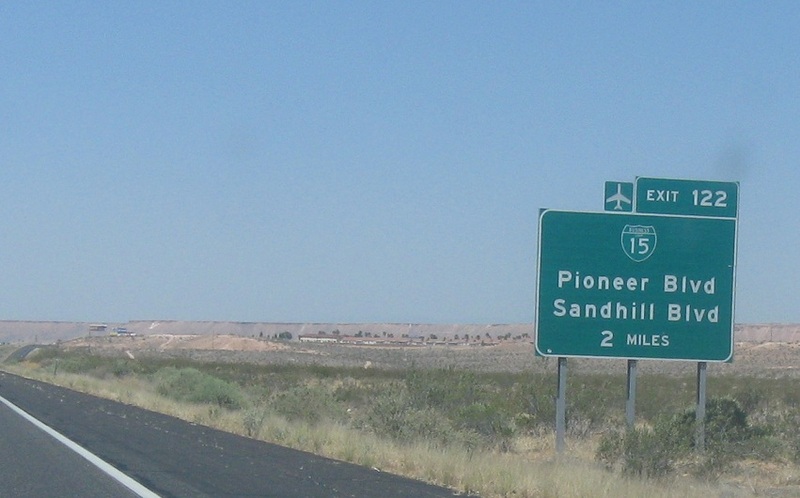 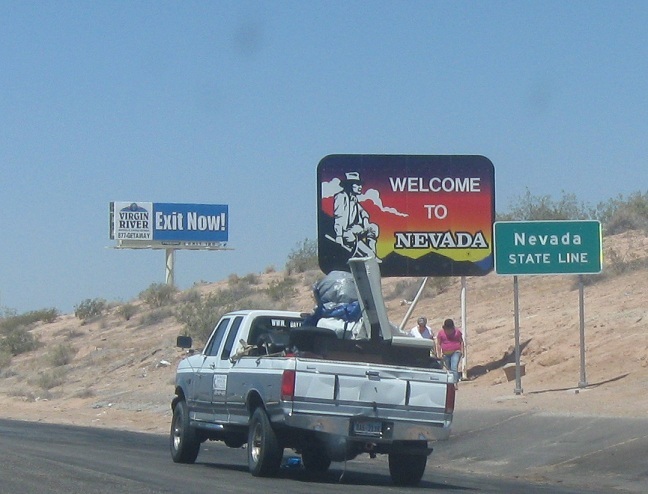 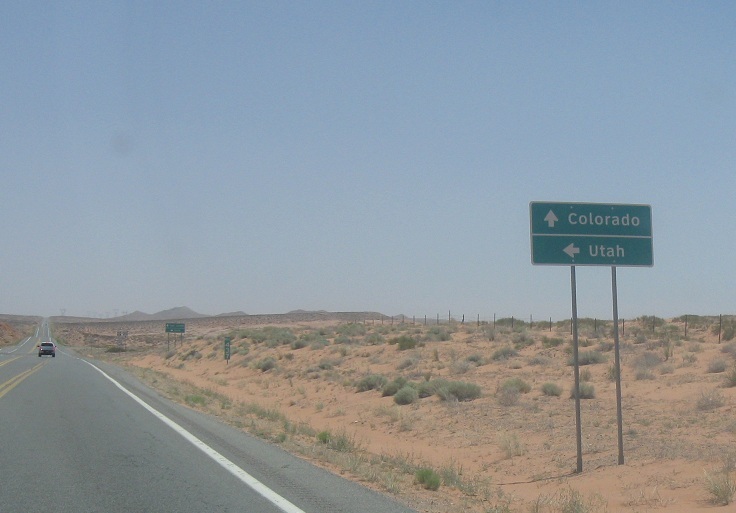 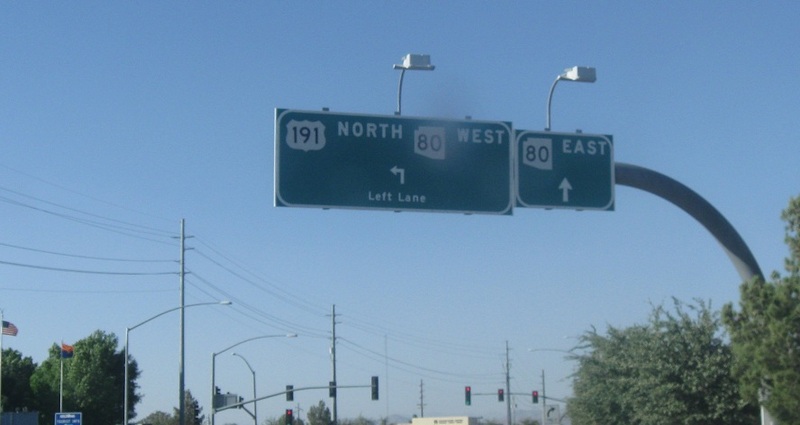 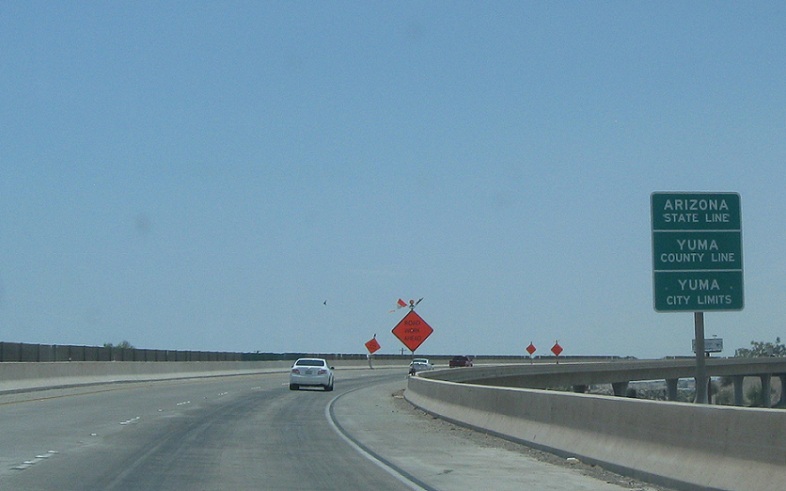 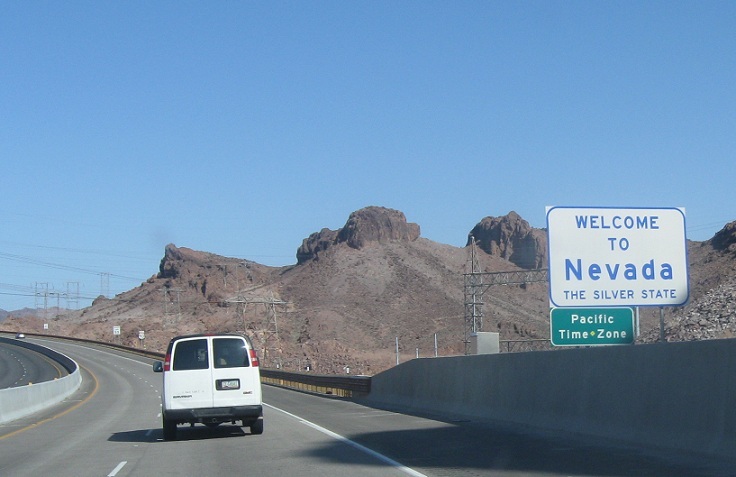 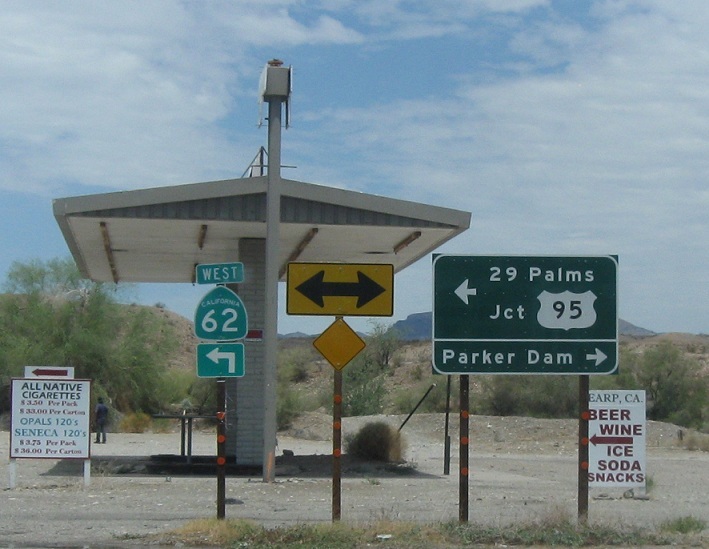 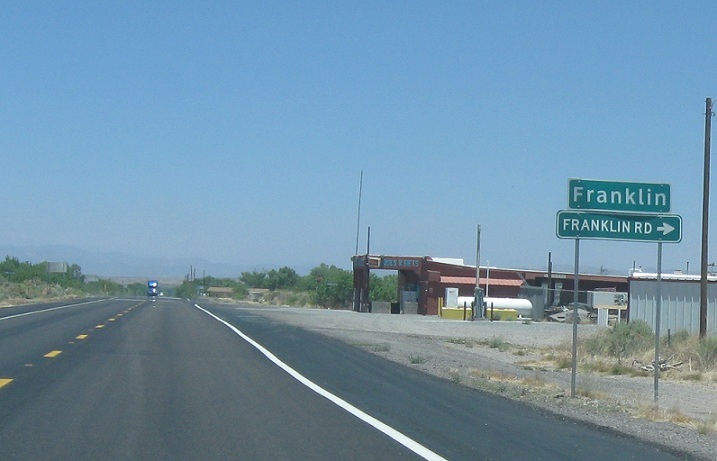 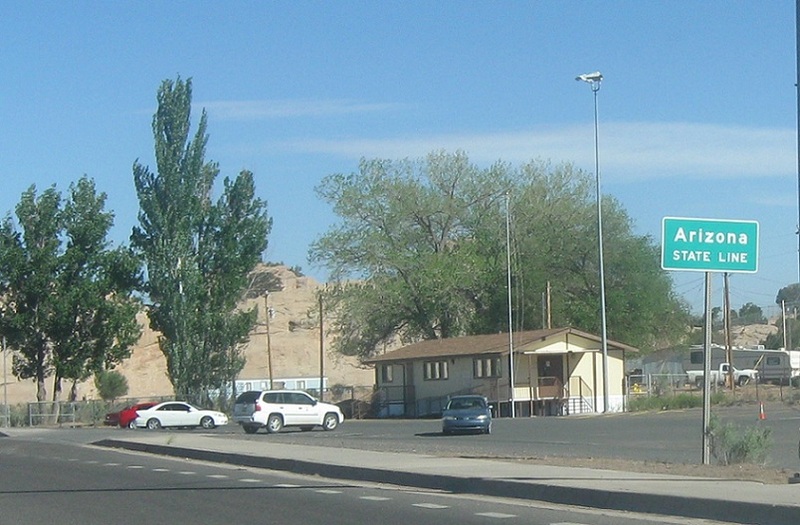 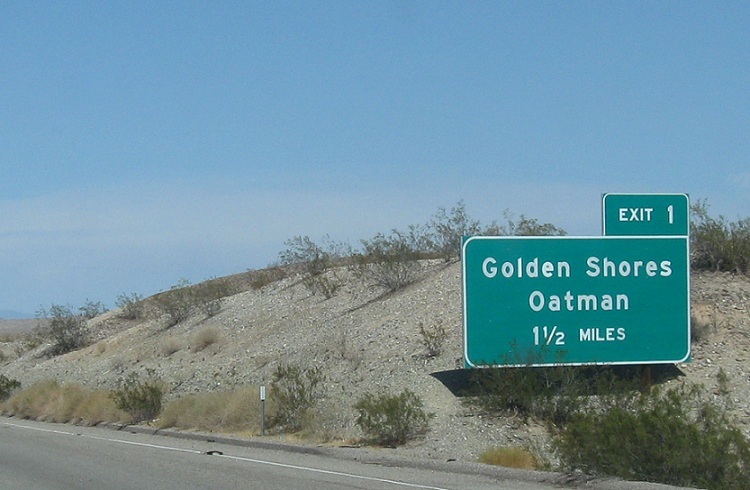 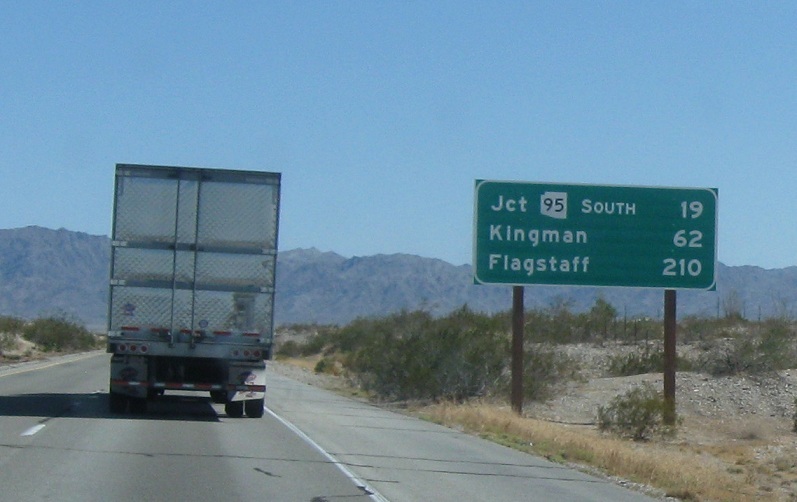 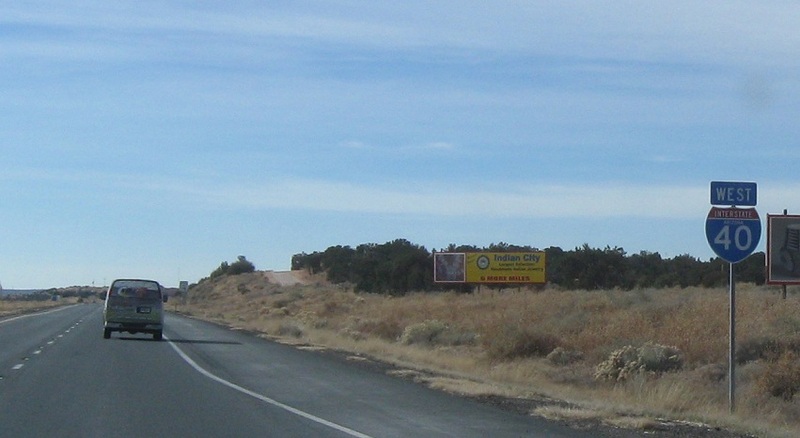 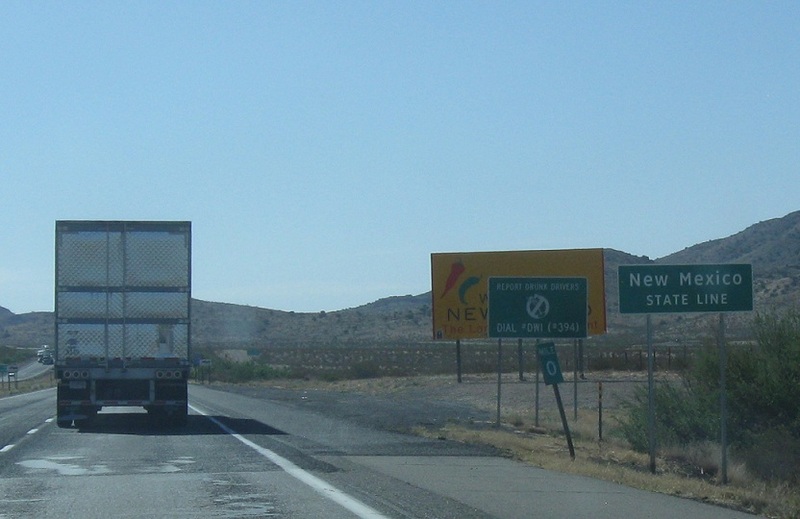 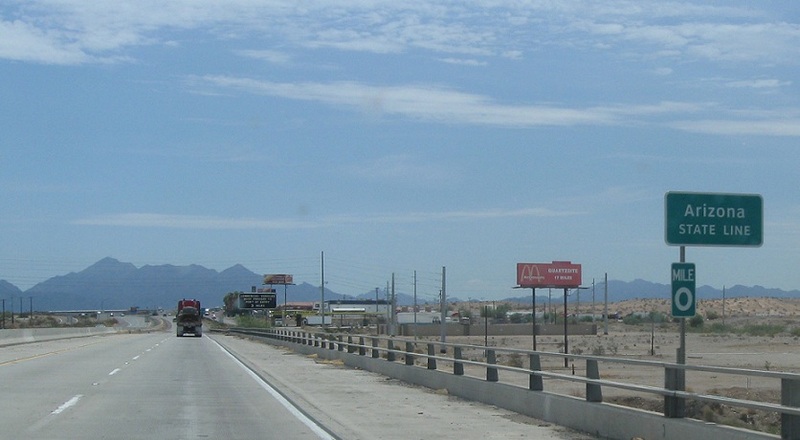 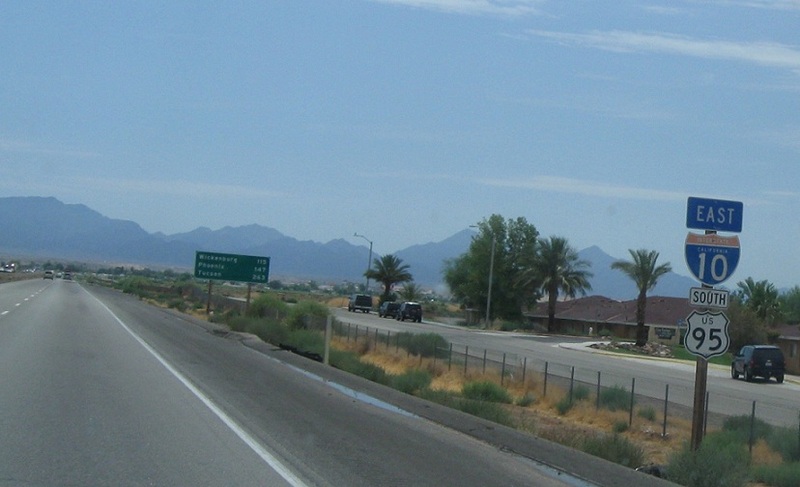 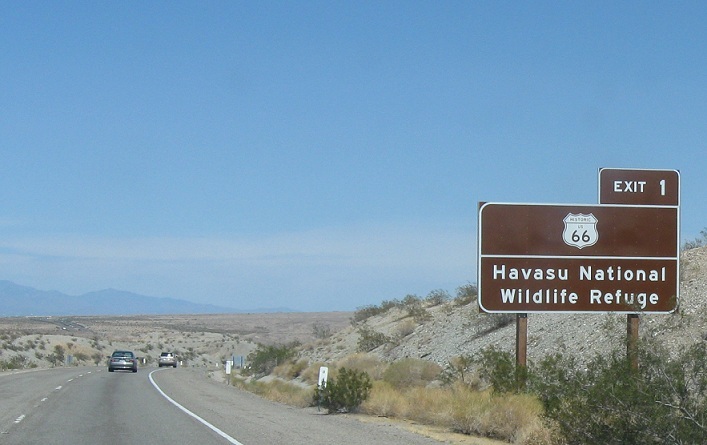 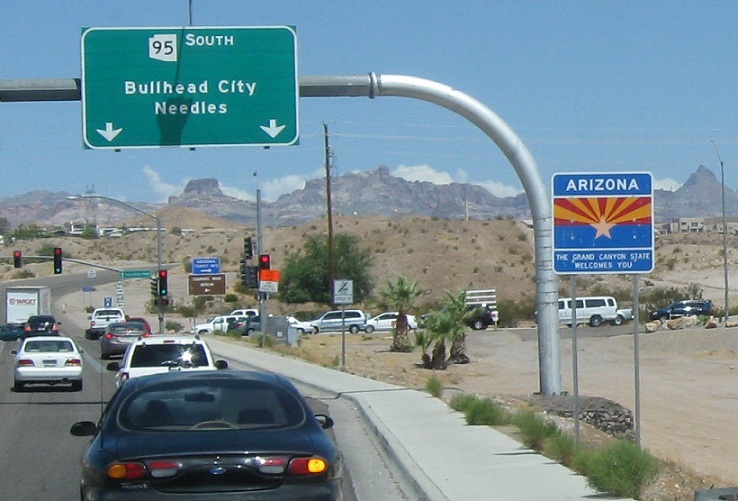 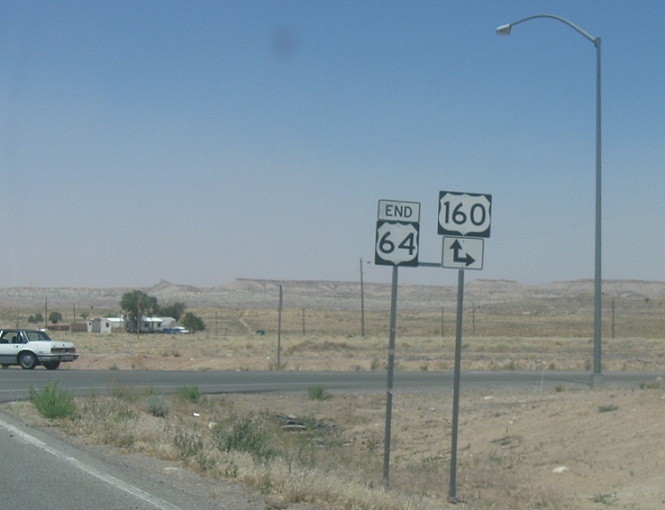 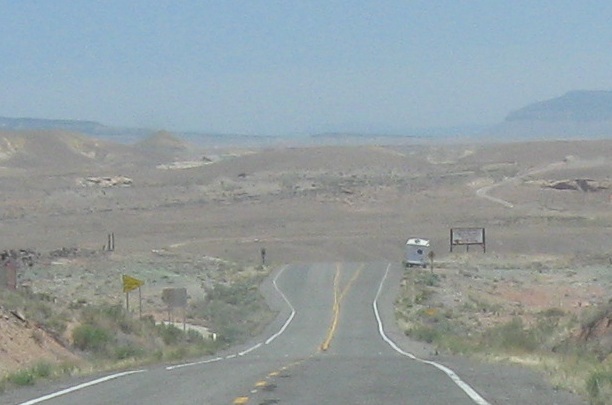 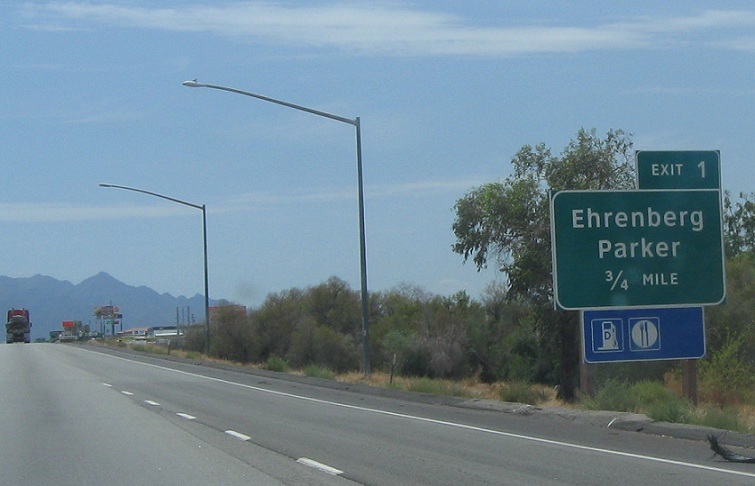 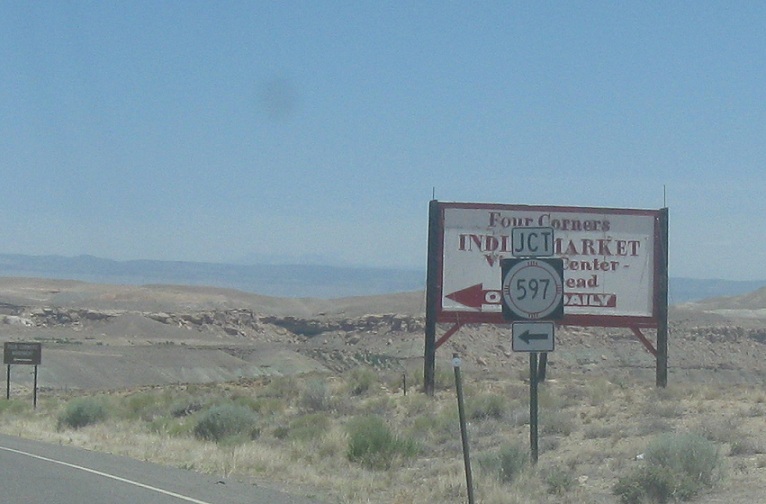 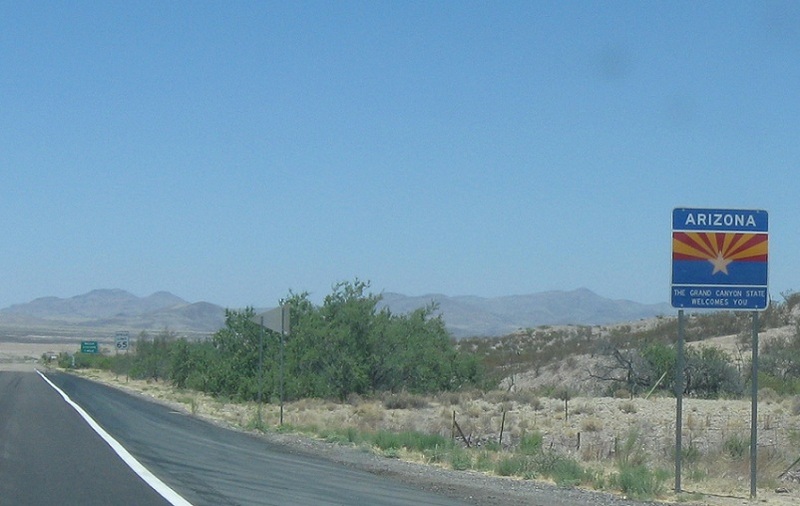 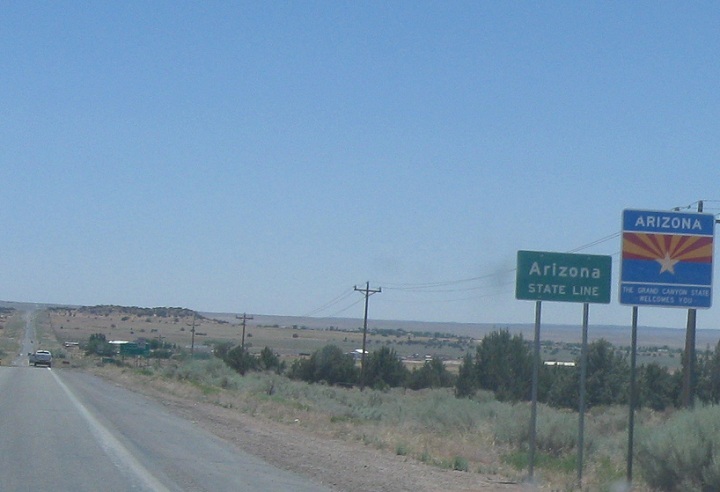 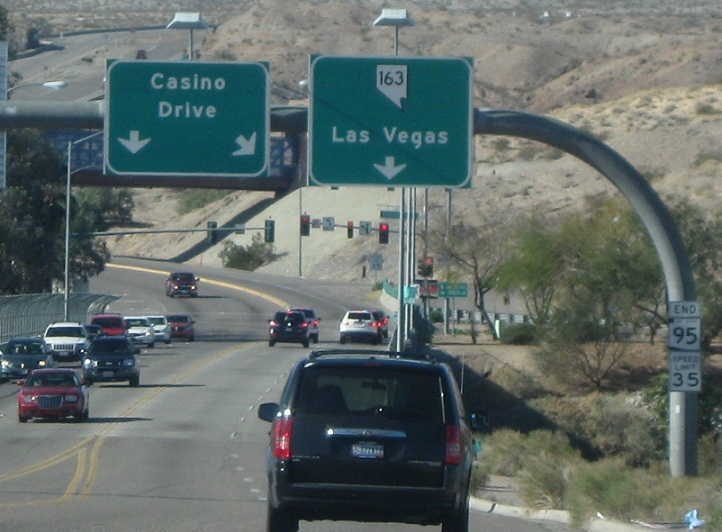 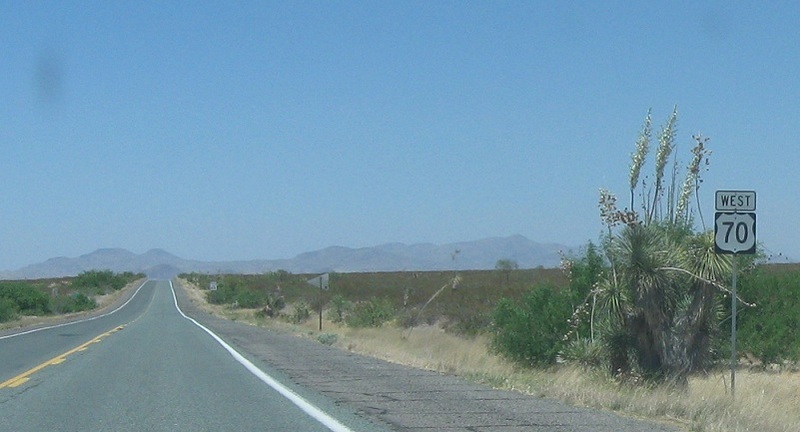 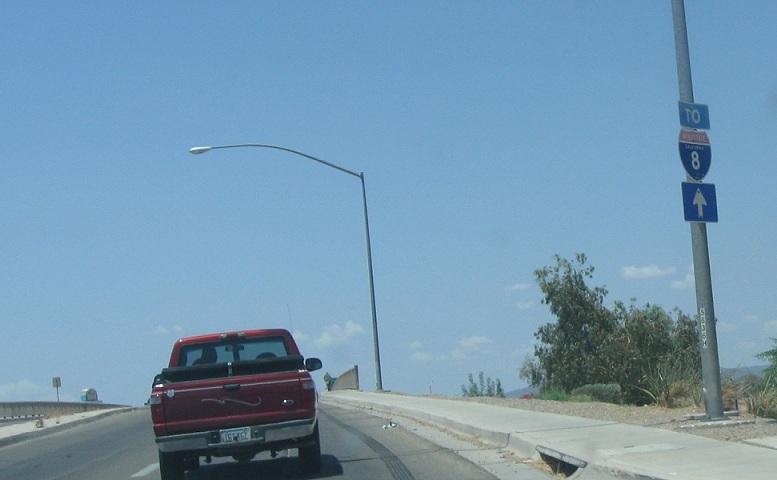 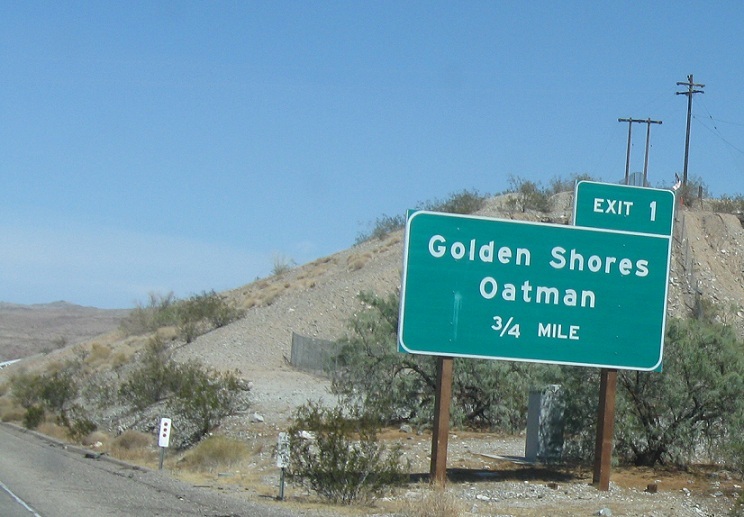 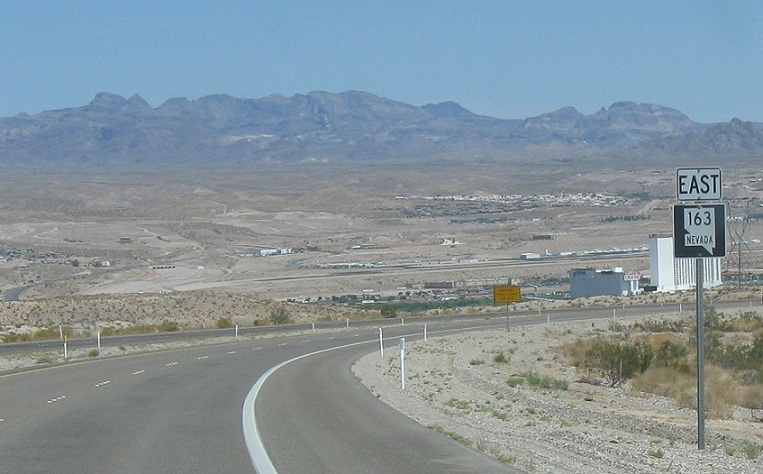 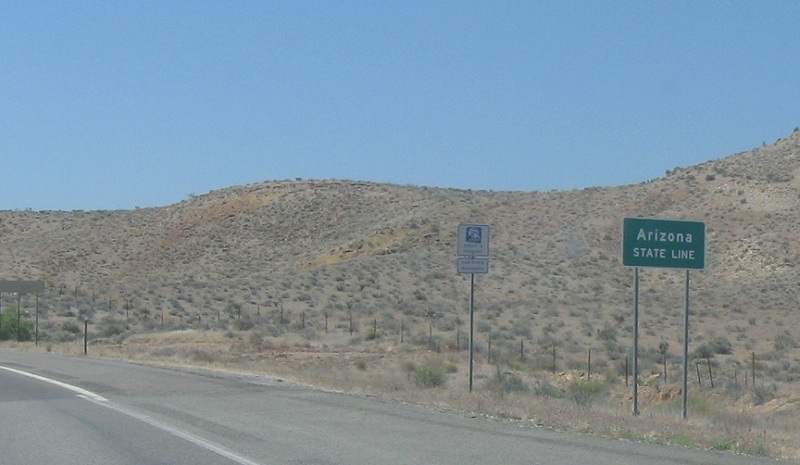 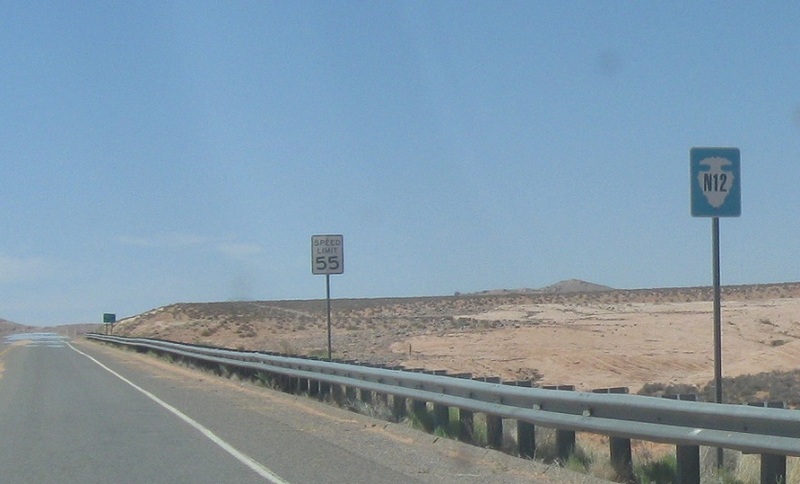 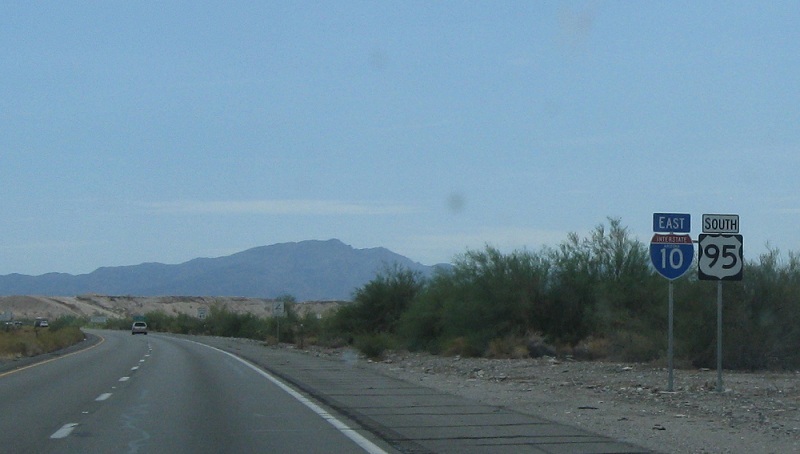 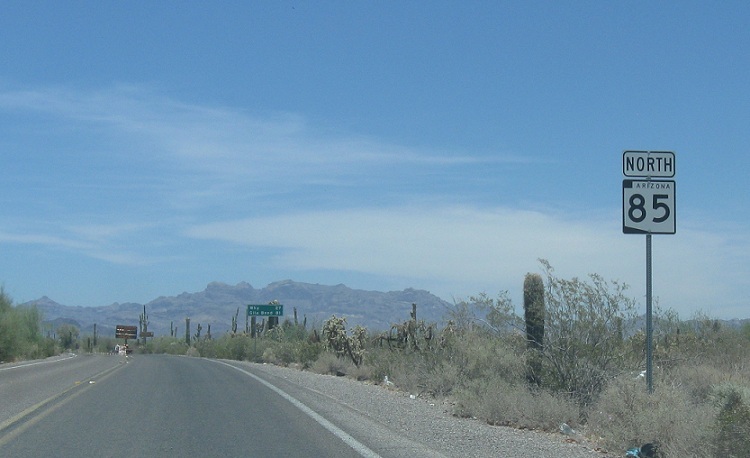 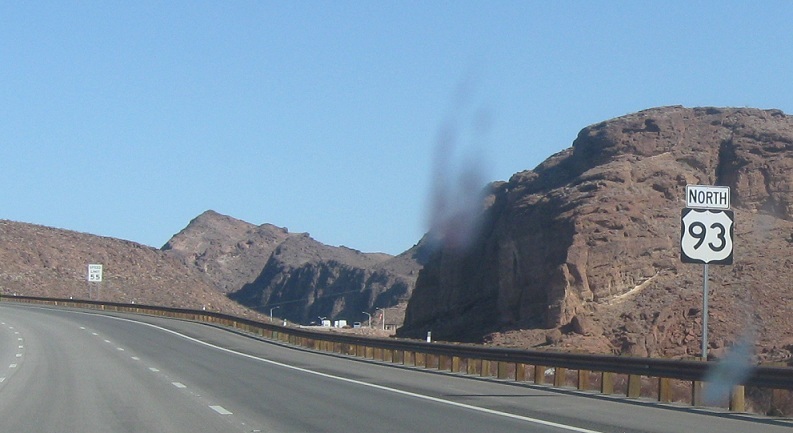 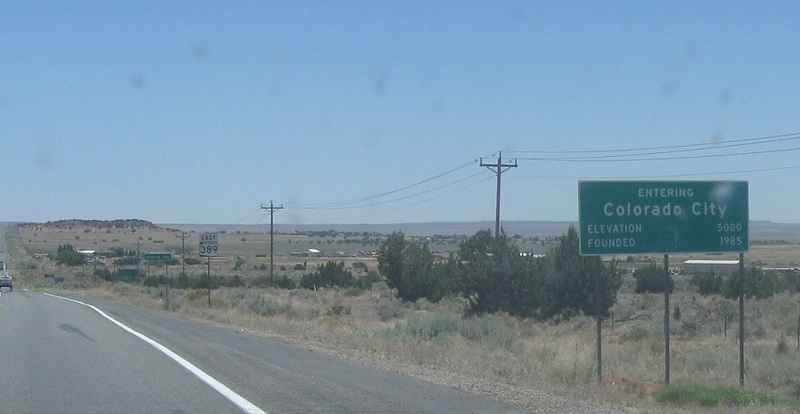 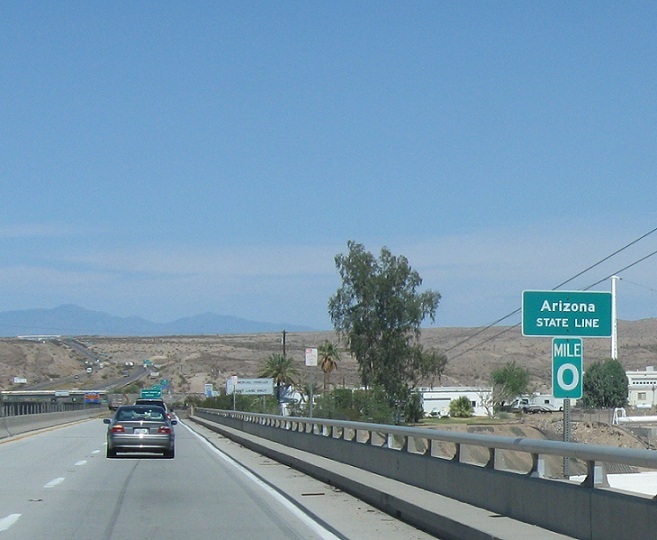 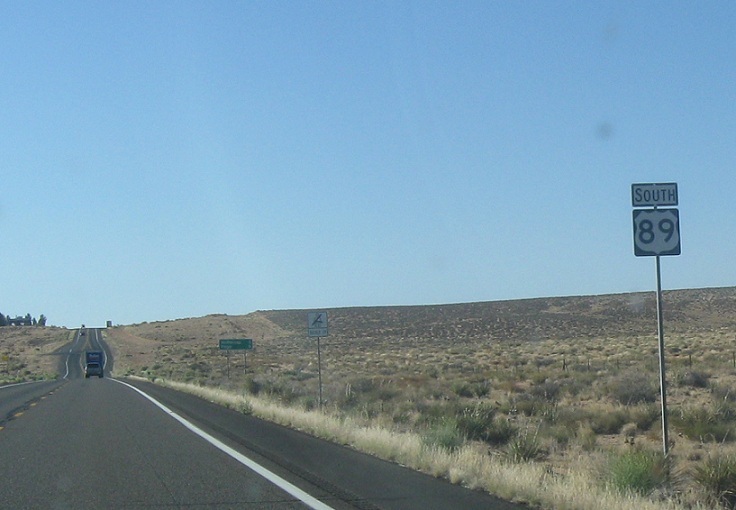 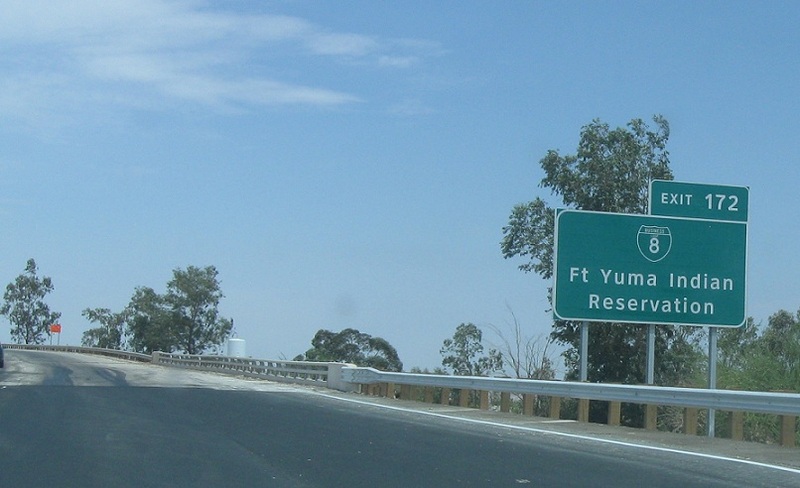 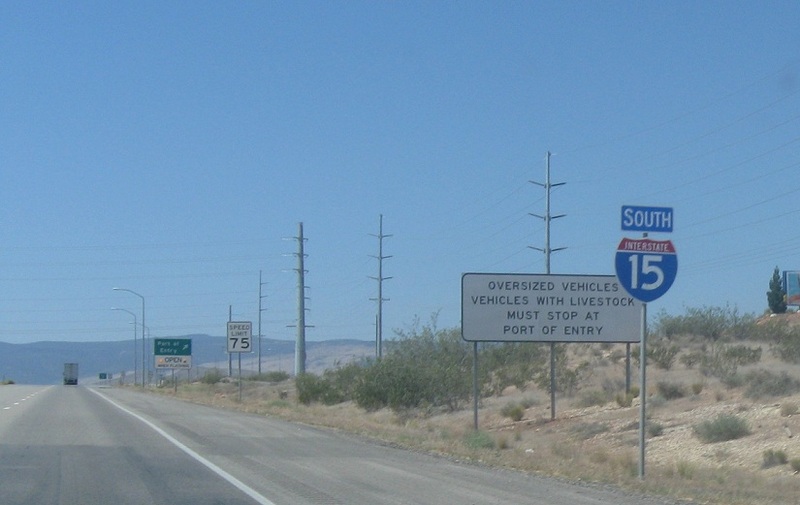 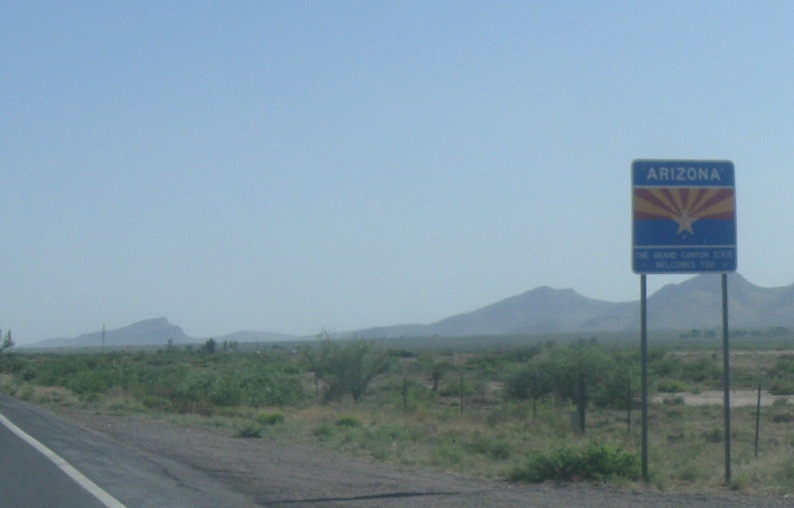 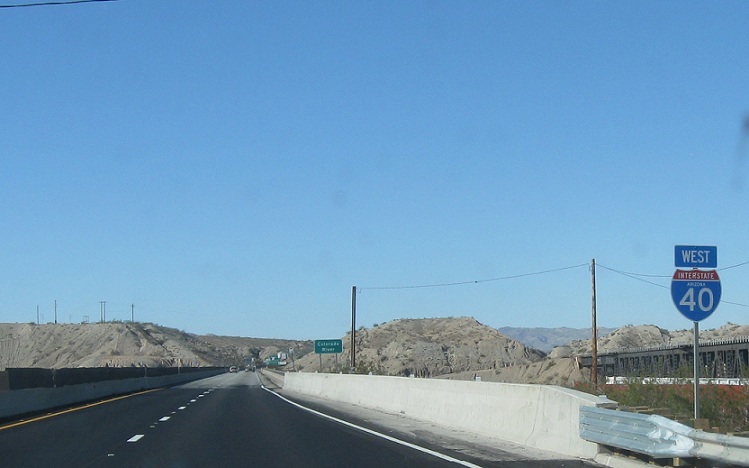 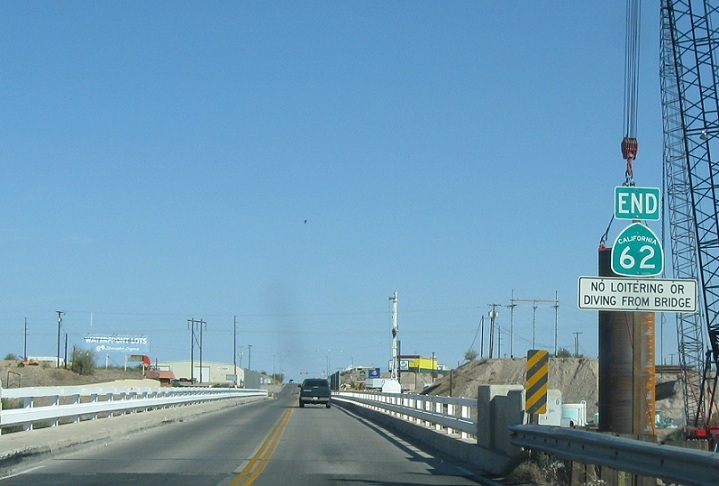 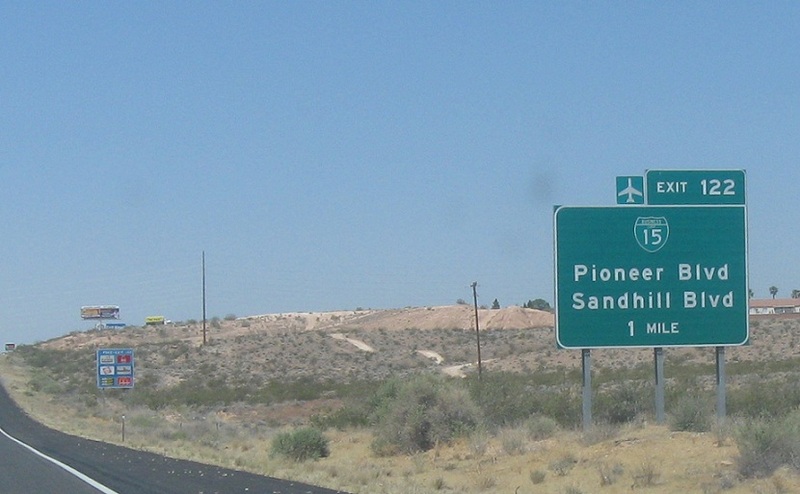 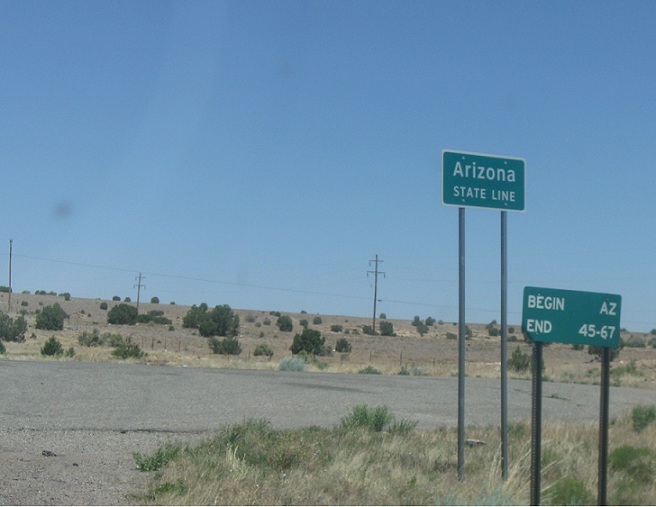 From SR 95 north, 95 ends at the Colorado River and the road transitions to Nevada 163- this sign is in Arizona. 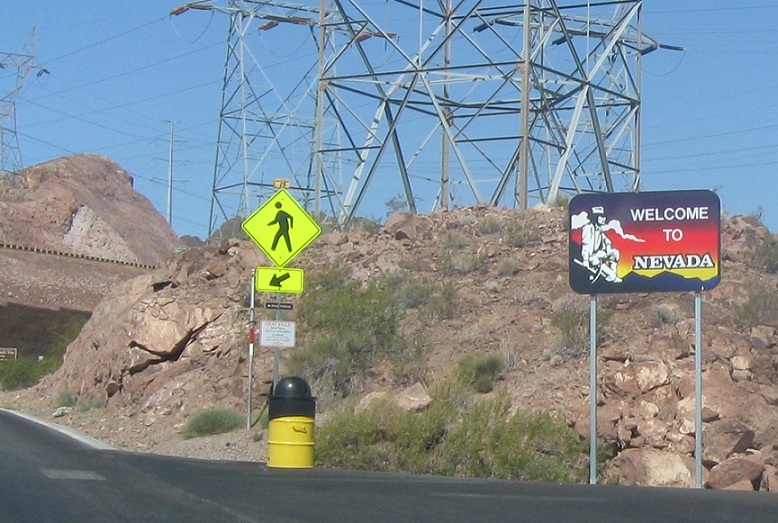 (Hoover Dam, AZ/NV) Final Arizona reassurance shield, Welcome to Nevada!, Relic Welcome to Nevada sign from NV-172, the old route of US-93 before the bridge was built. 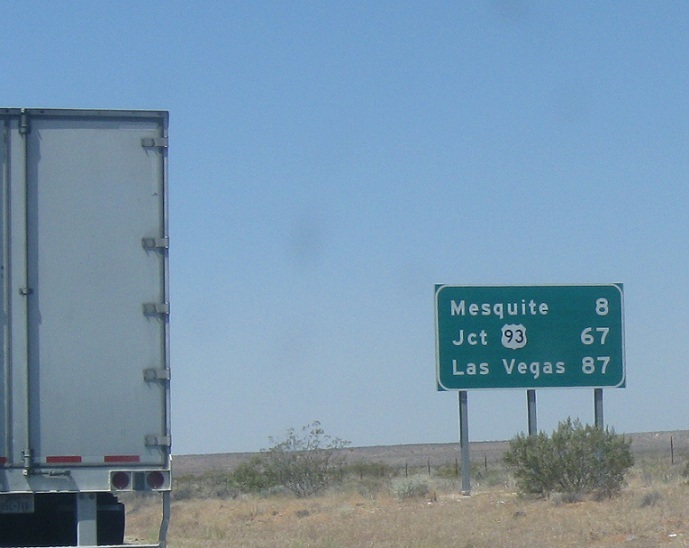 (Mesquite, NV) Advance signage for US-93 in Nevada north of Las Vegas, advance signage for the 15 loop in Mesquite just over the border, more advance signage, Welcome to Nevada!